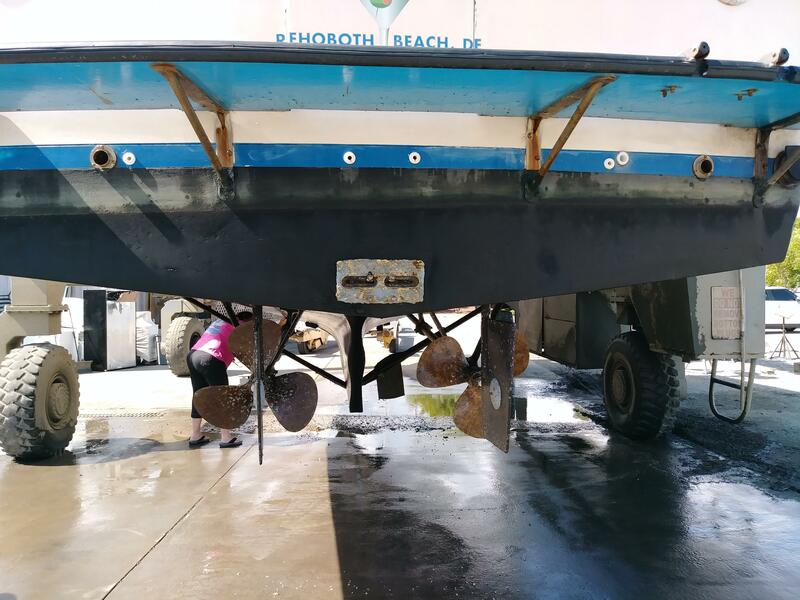 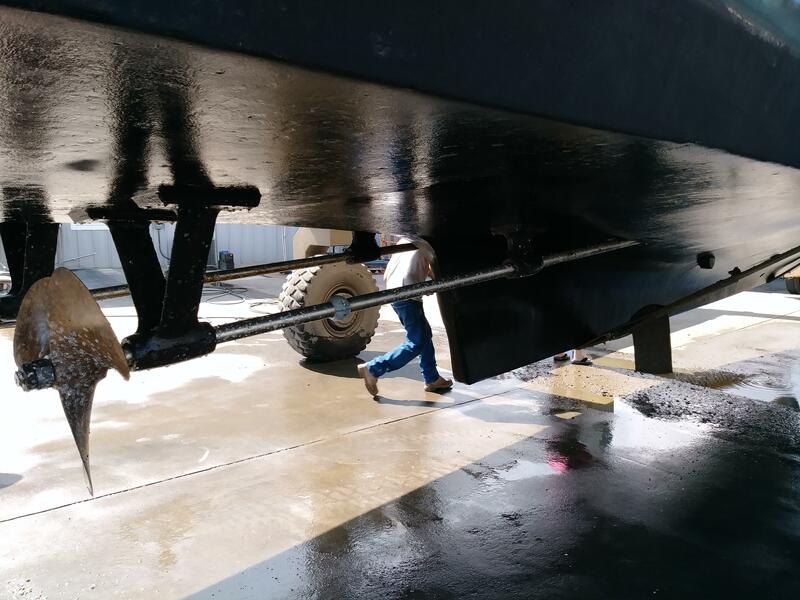 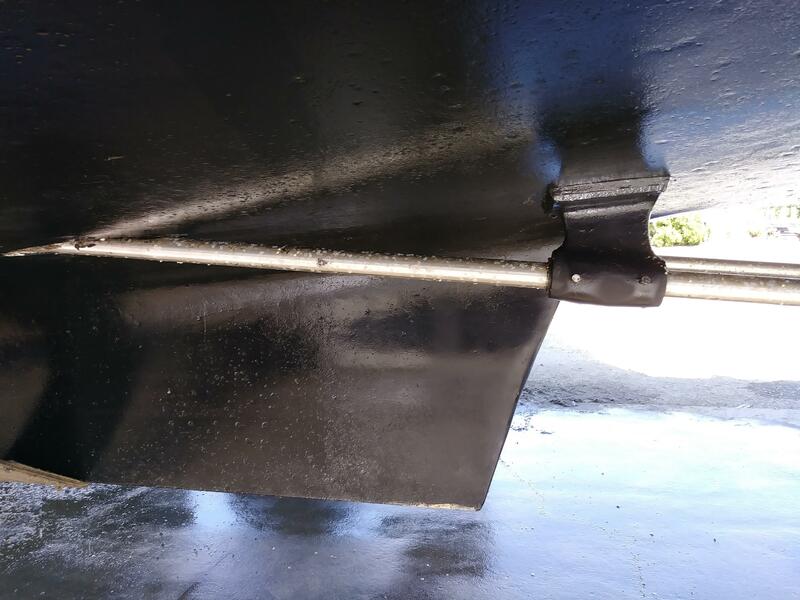 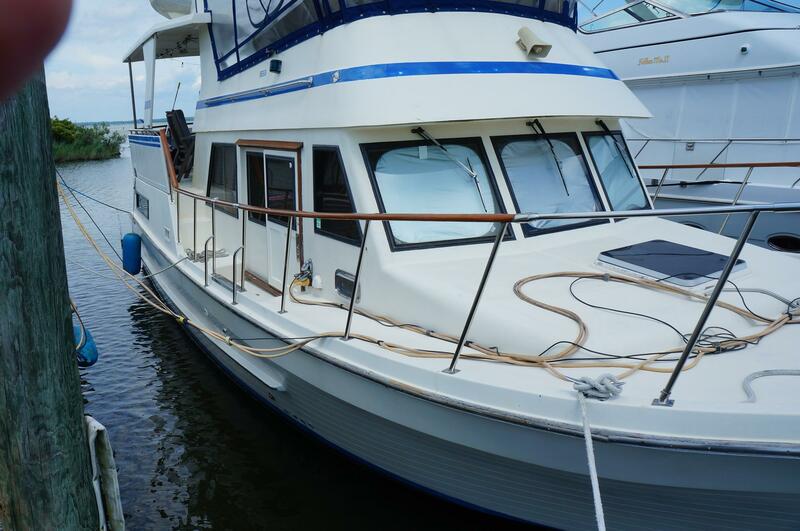 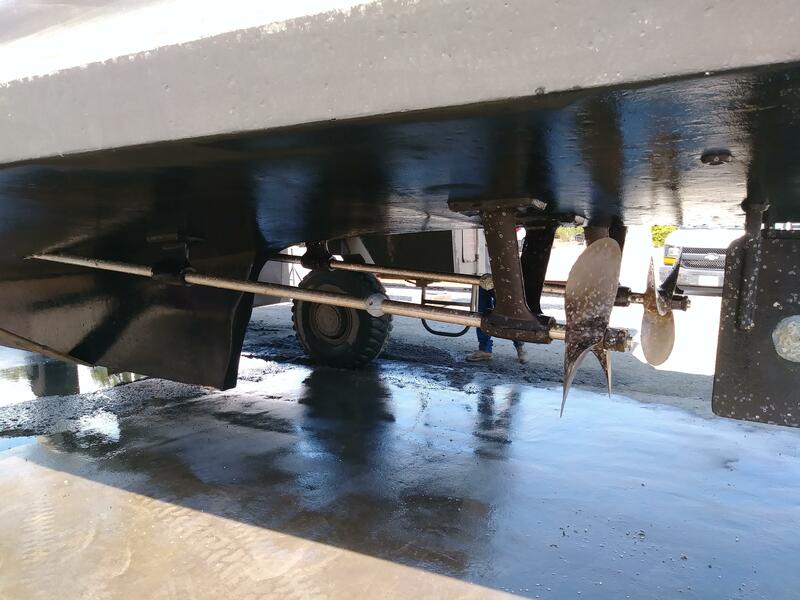 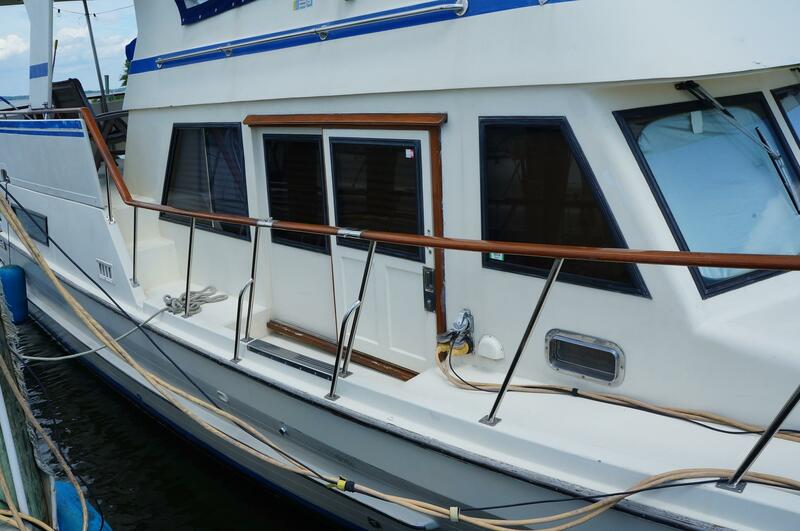 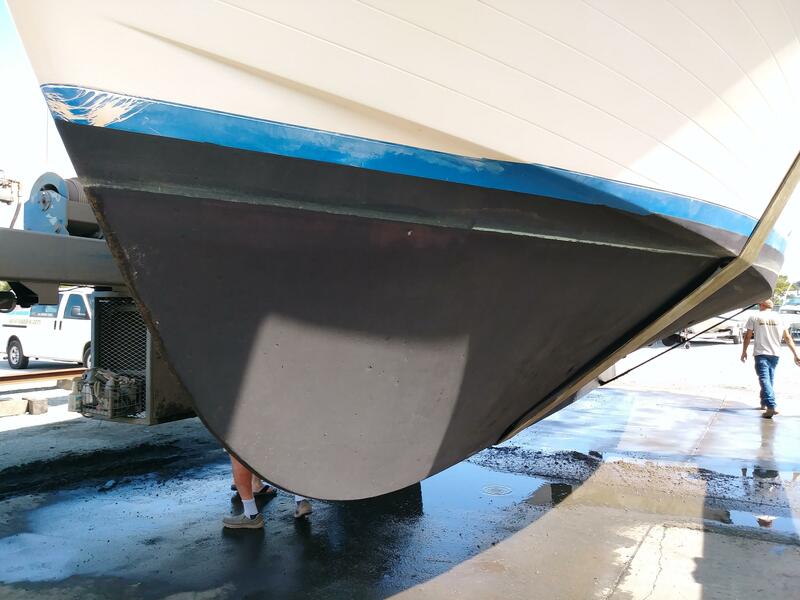 THIS IS A FANTASTIC LONG RANGE CRUISER THAT HAS BEEN METICULOUSLY MAINTAINED BY HER CURRENT OWNERS AND A CERTIFIED VOLVO MARINE SERVICE CENTER! 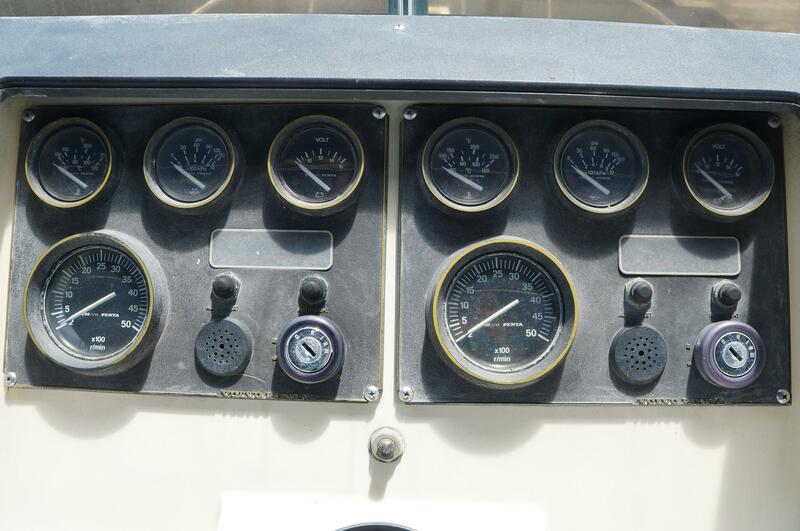 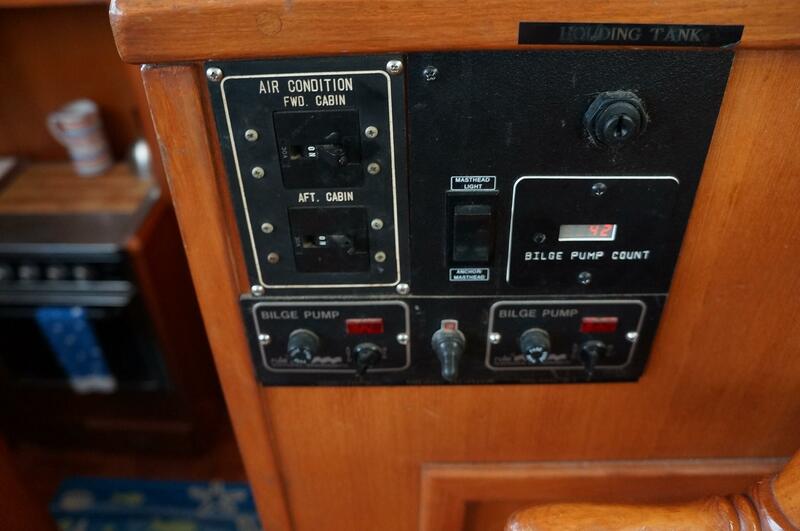 SHE WILL CRUISE AT 9 TO 10 KNOTS BURNING ONLY 4-4.5 GALLONS PER HOUR TOTAL!! 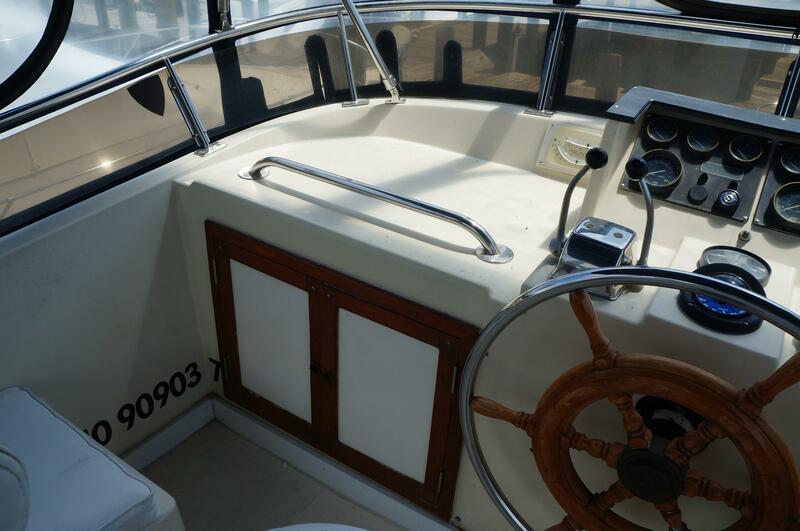 AND HER WIDE OPEN WILL GET YOU TO 15-17 KNOTS!!! 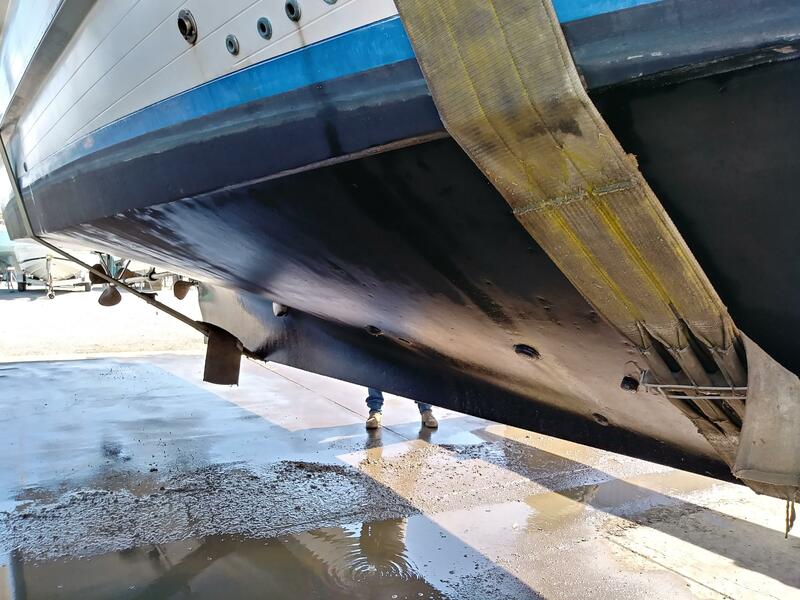 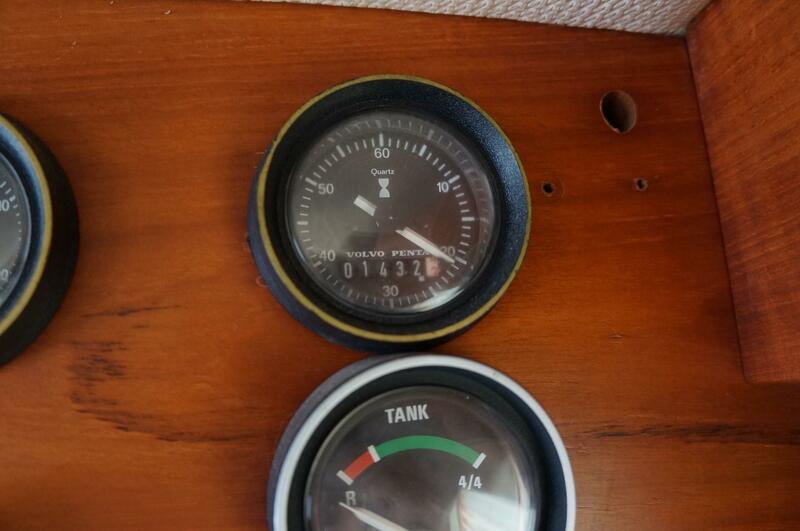 WITH 400 GALLONS OF FUEL, SHE'S A TRUE LONG DISTANCE CRUISER!! 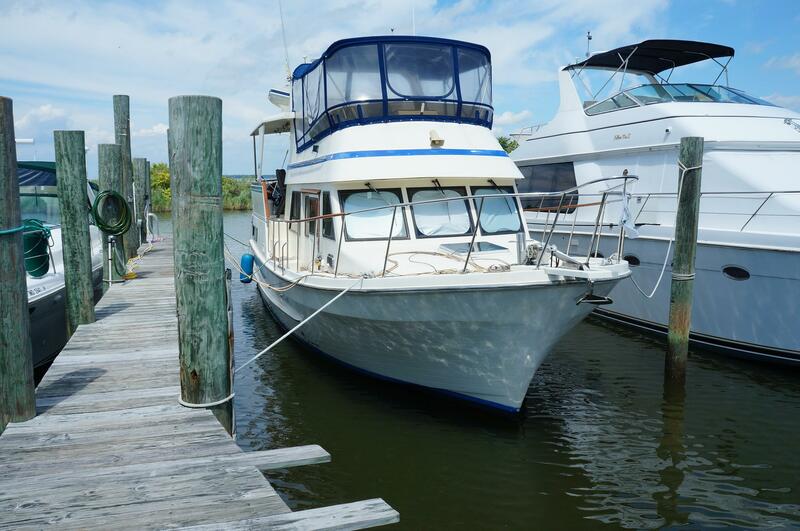 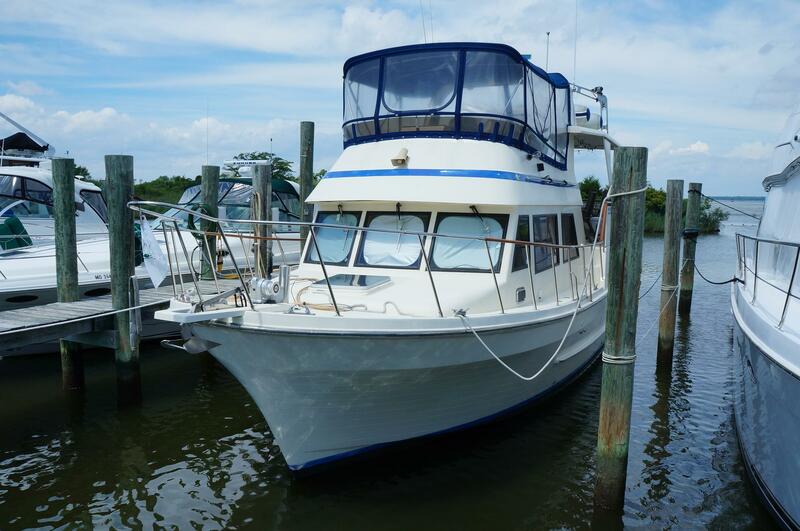 HER CURRENT OWNERS HAVE LOVED HER FOR MANY YEARS AND HAVE CRUISED HER DOWN THE INTER-COASTAL AND ALL OVER THE CHESAPEAKE BAY. 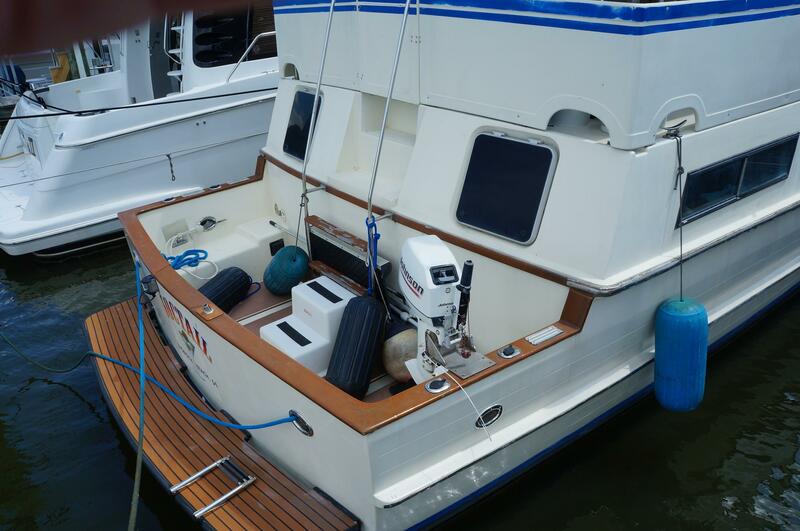 HER TWIN VOLVO DIESELS WILL GIVE YOU A COMFORTABLE TRAWLER CRUISE FROM 8 TO 9 KNOTS AND WIDE OPEN SPEEDS AROUND 14 KNOTS WHEN YOU NEED TO GO. 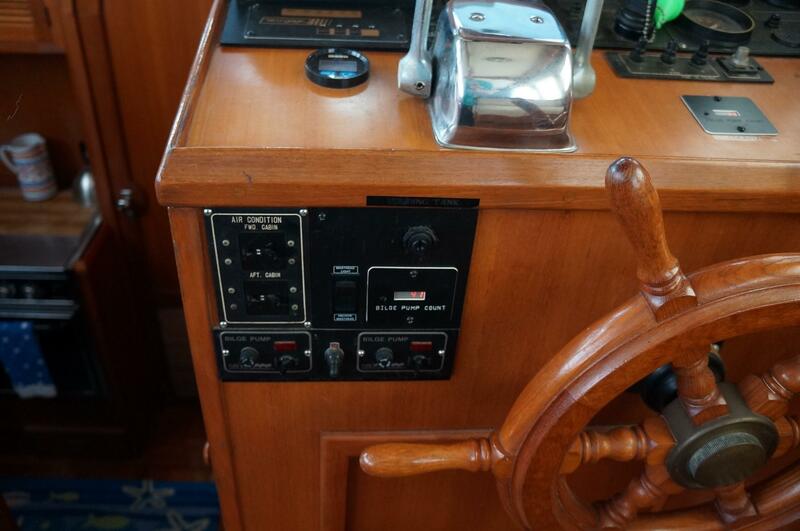 SHE IS BASICALLY THE "MARINE TRADER LaBELLE" W/ THE COCKPIT. 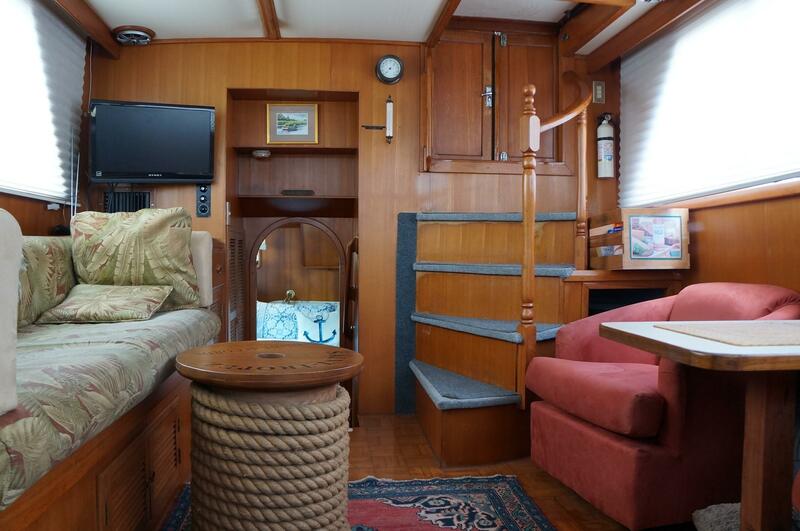 AS YOU ENTER THE MAIN SALON FROM THE ENORMOUS AFT DECK YOU ARE SURROUNDED BY HUGE WINDOWS AND BEAUTIFUL WOODWORK WITH A DINETTE TABLE TO THE PORT AND A BUILT IN SOFA ON THE STARBOARD. 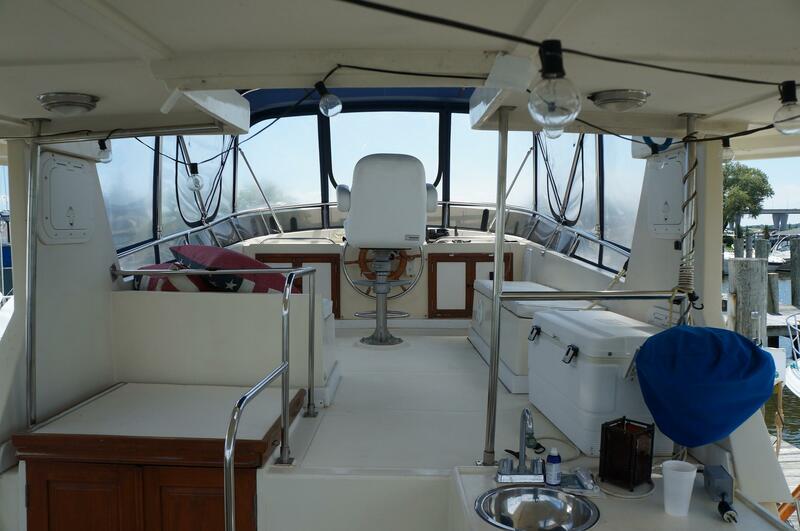 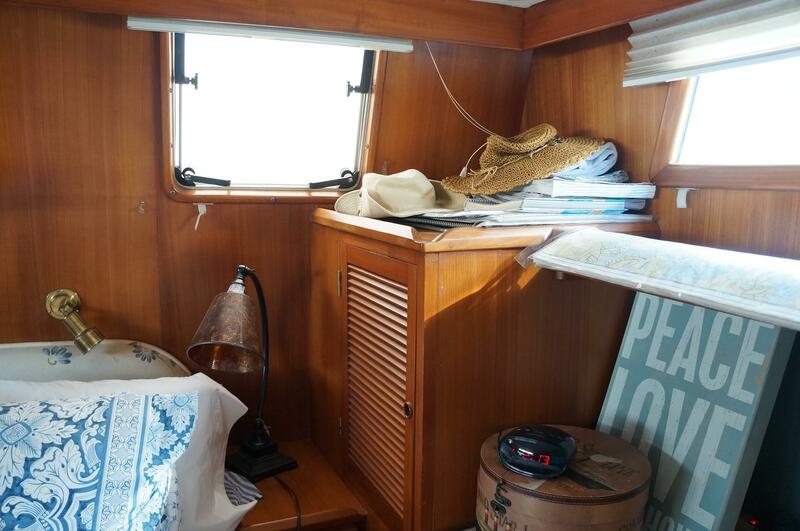 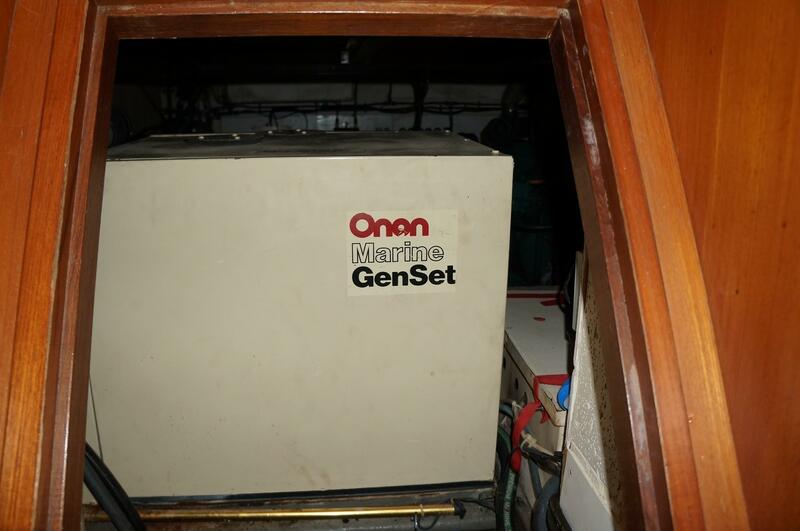 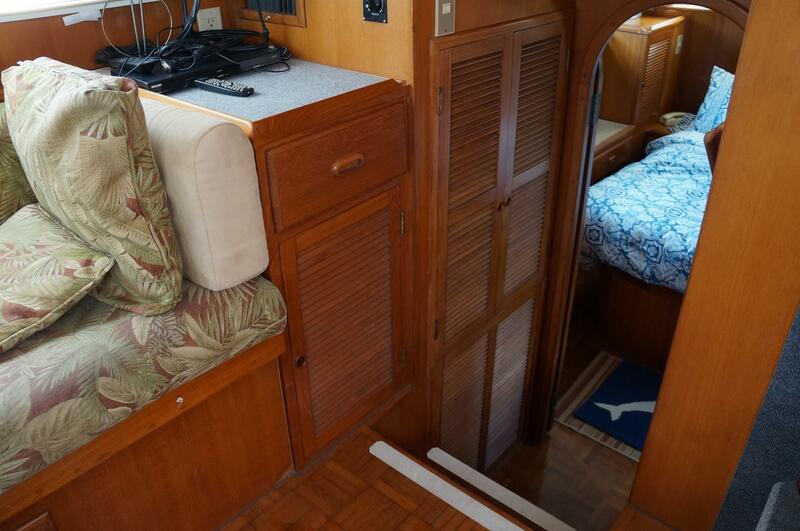 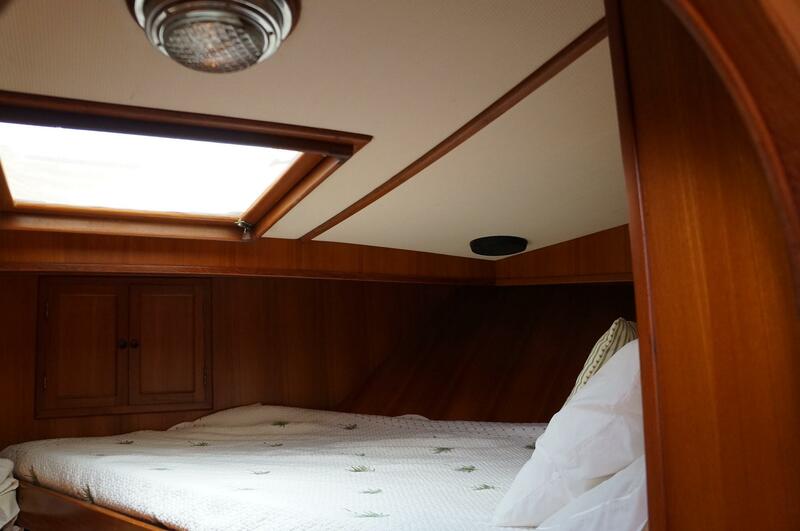 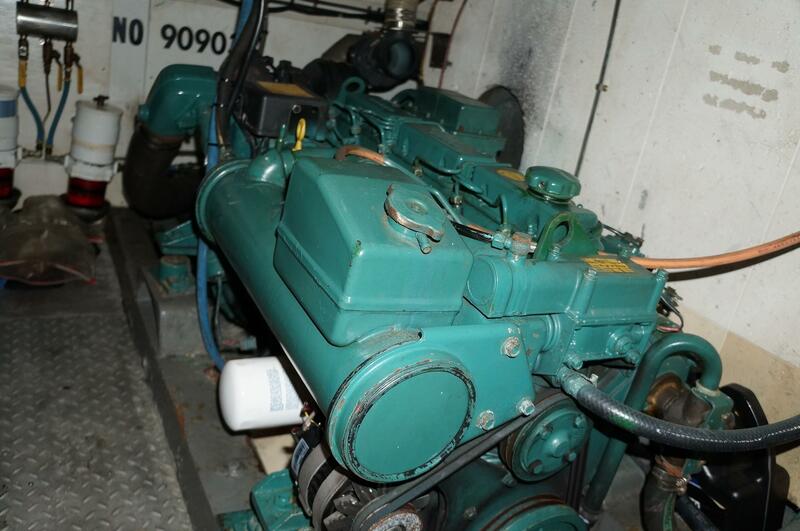 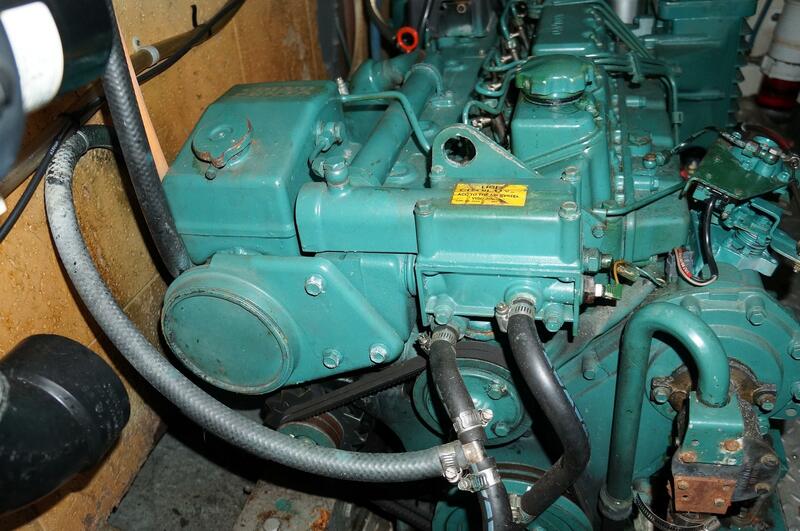 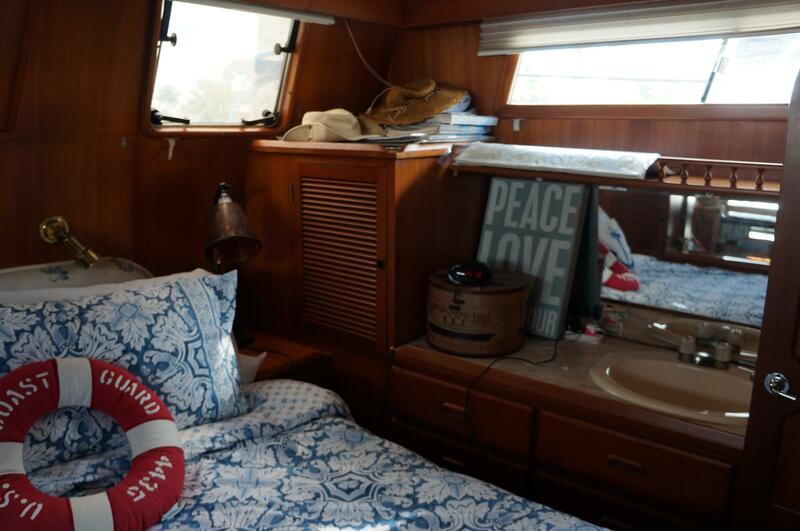 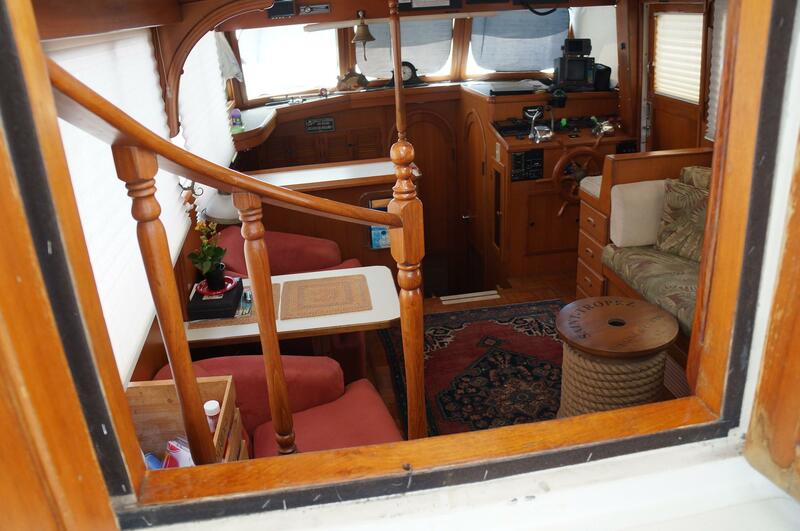 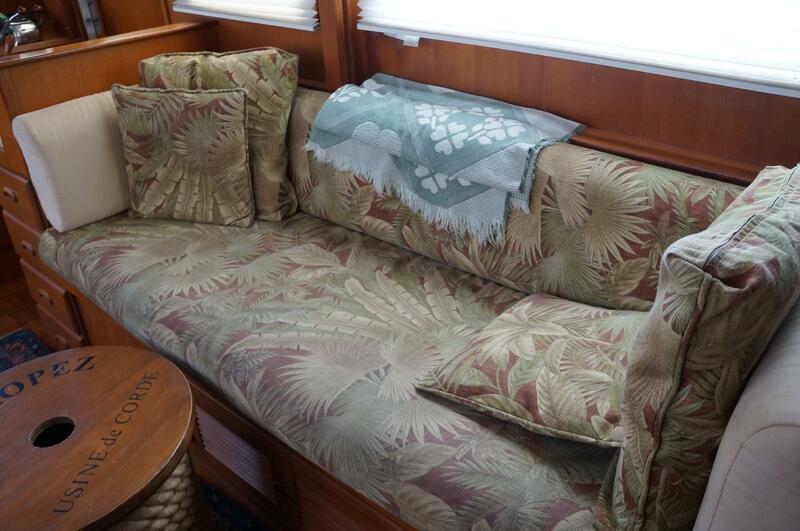 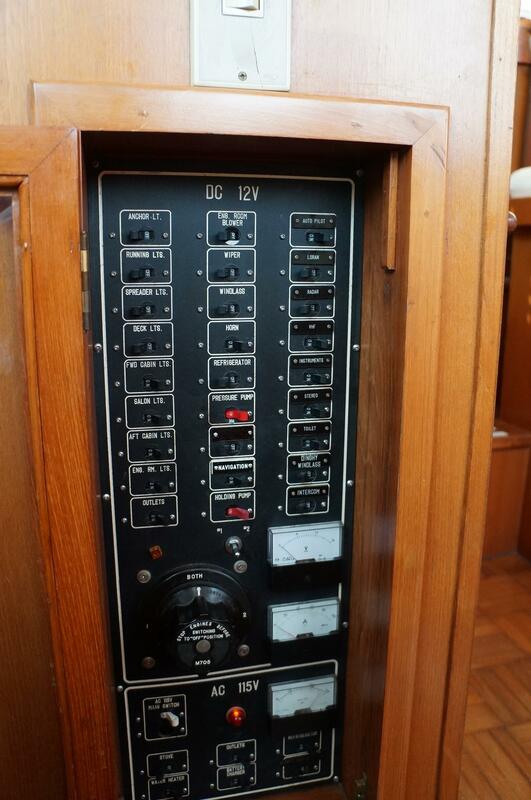 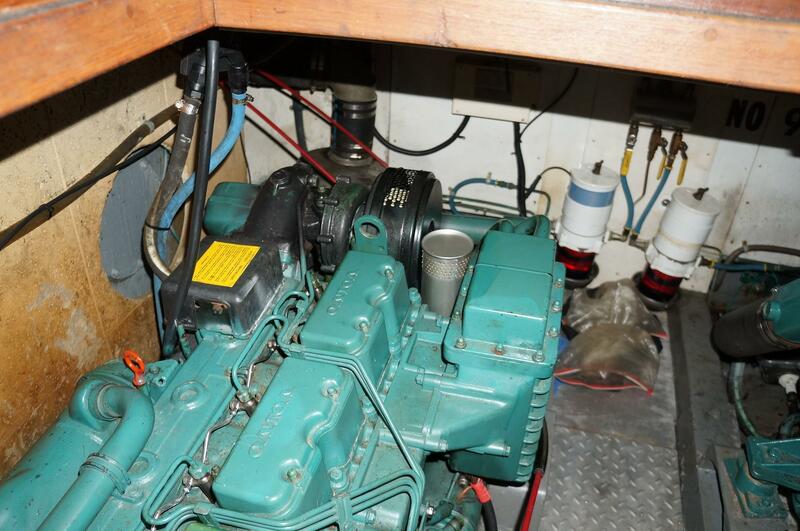 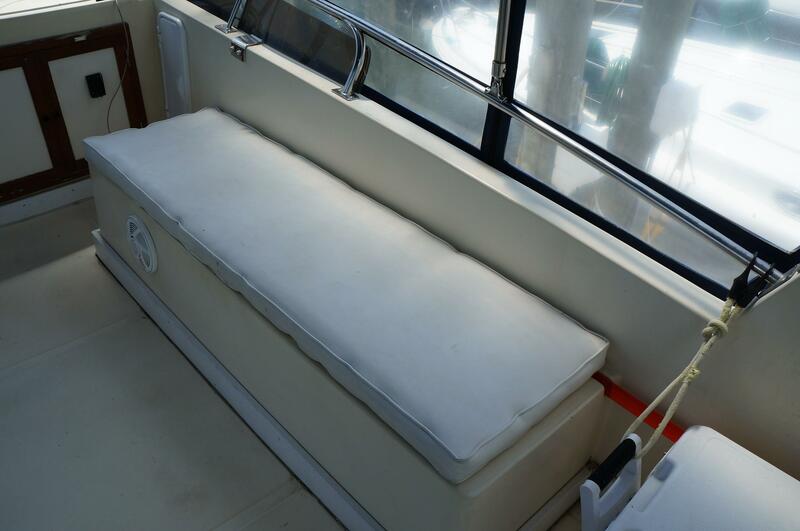 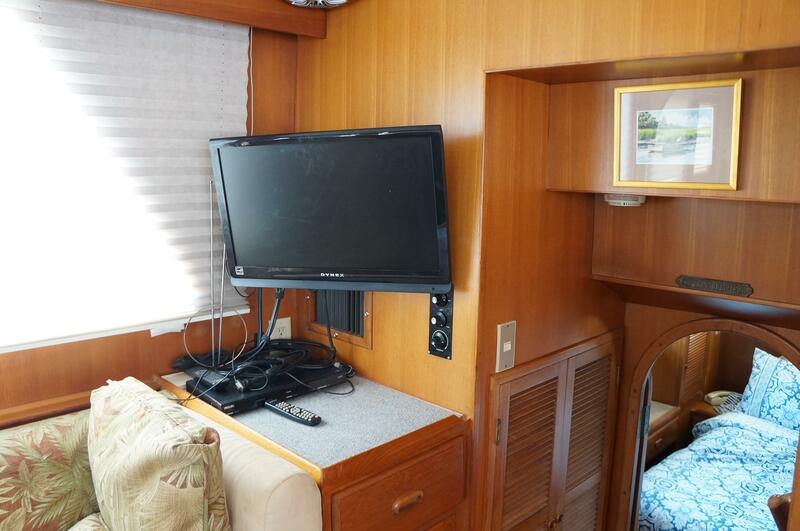 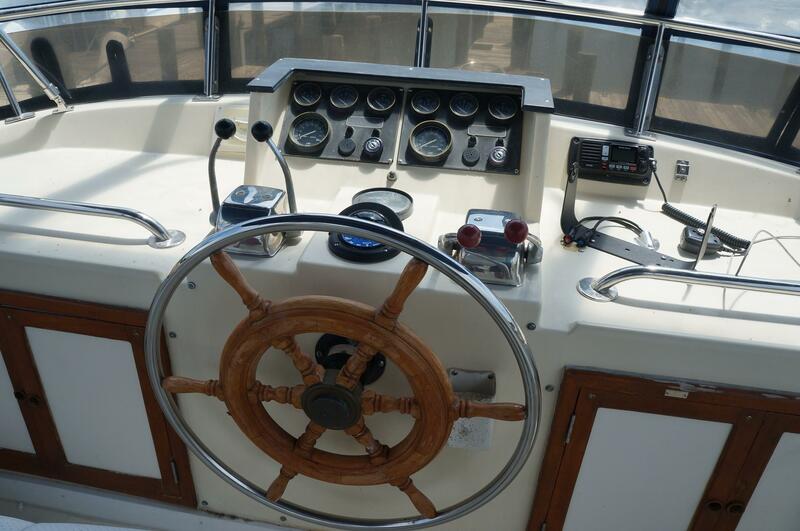 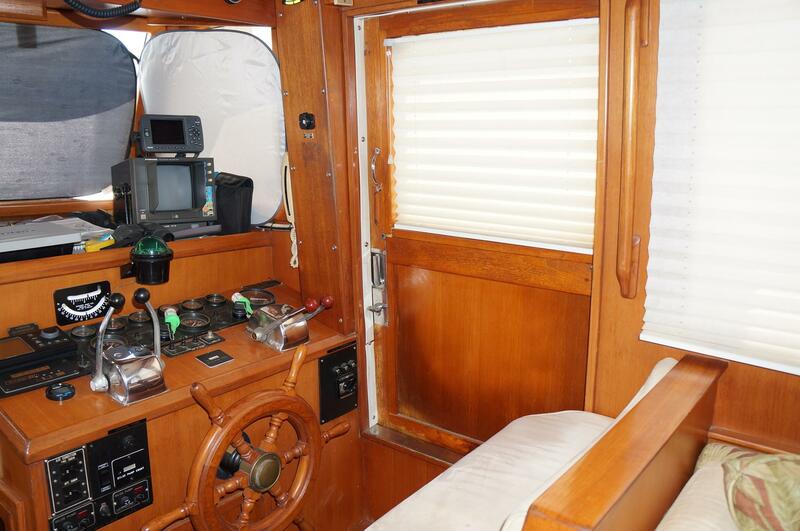 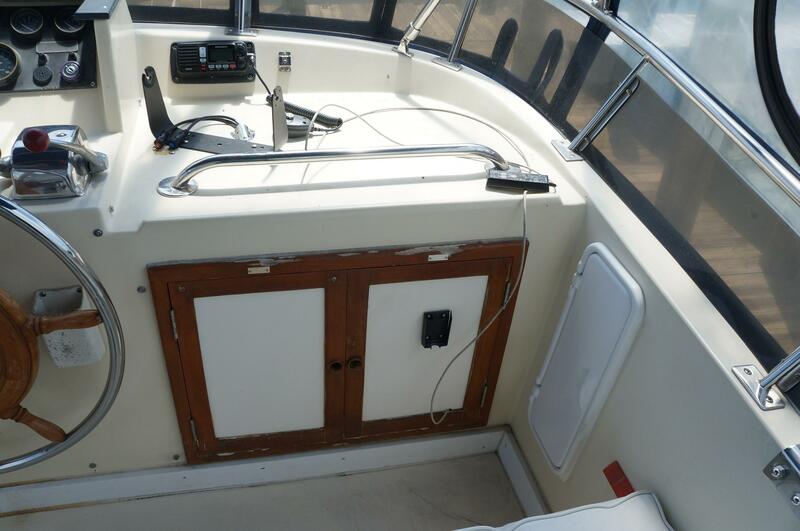 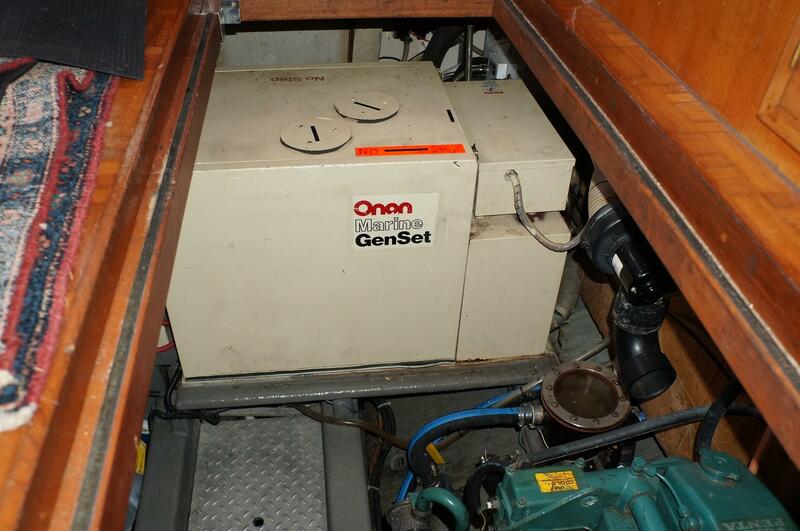 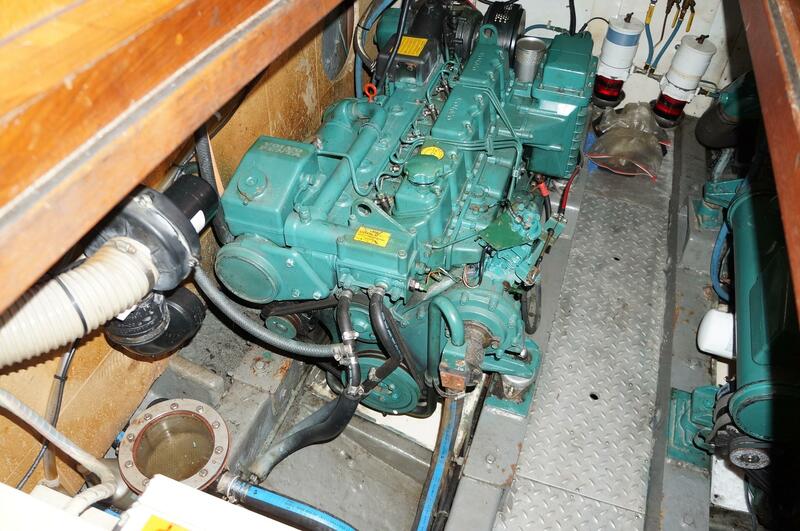 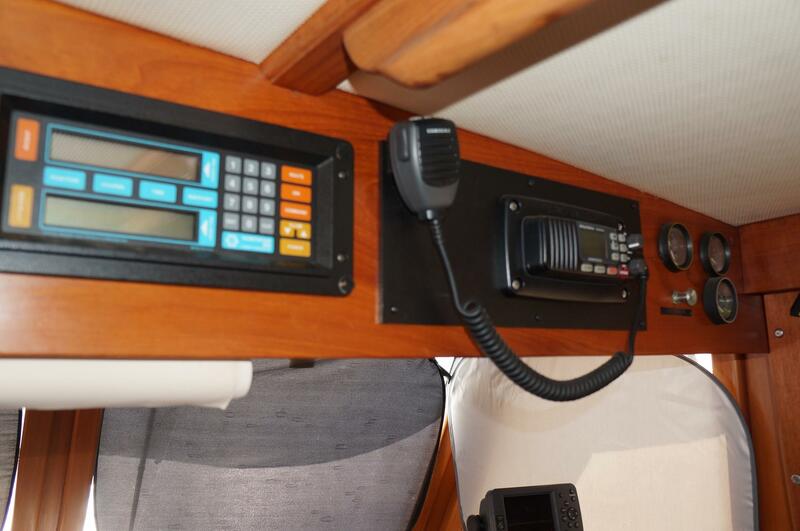 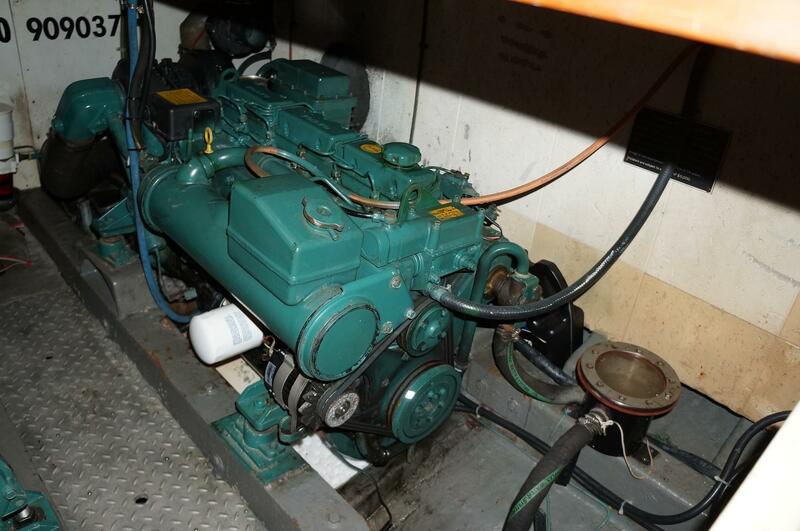 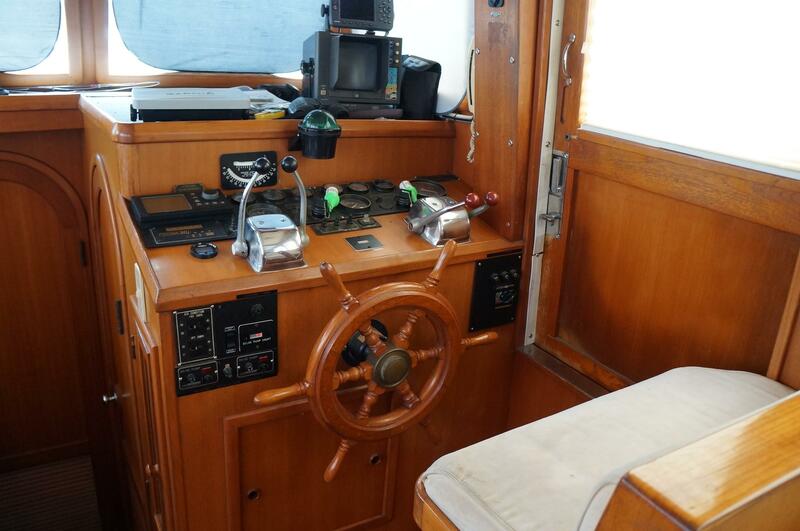 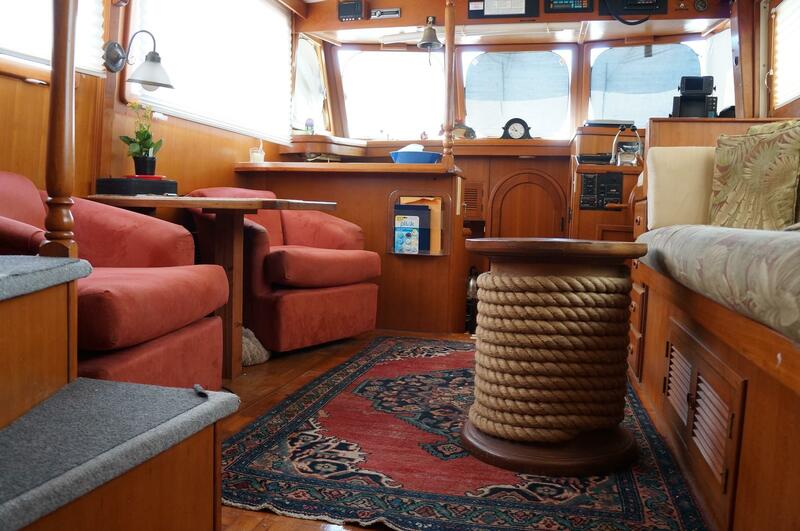 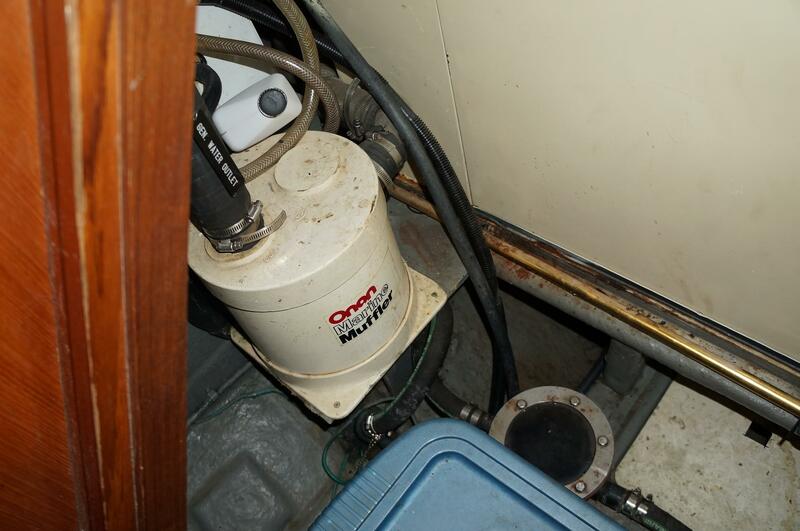 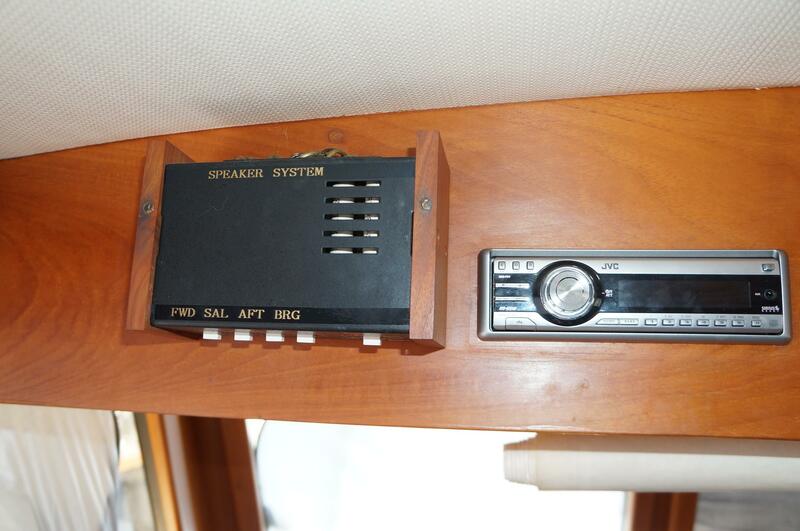 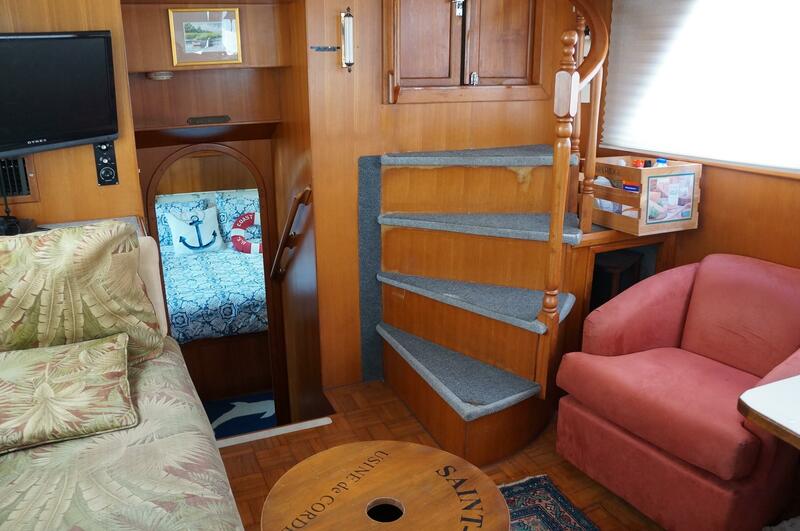 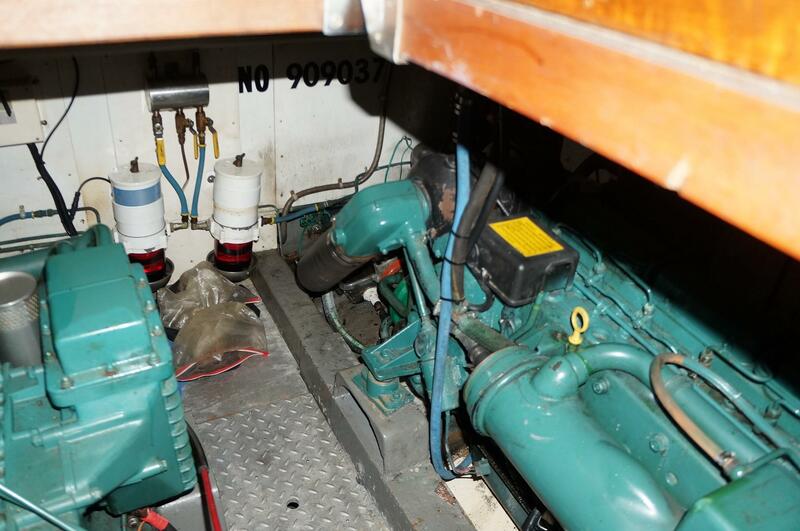 HER LOWER HELM AND SIDE DOOR ARE JUST FORWARD OF THE SOFA AND OFFER FULL INSTRUMENTATION AND ELECTRONICS. 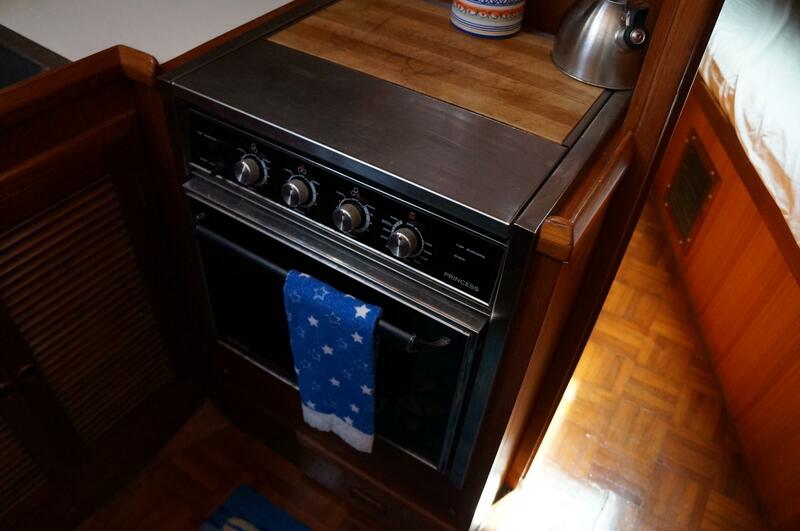 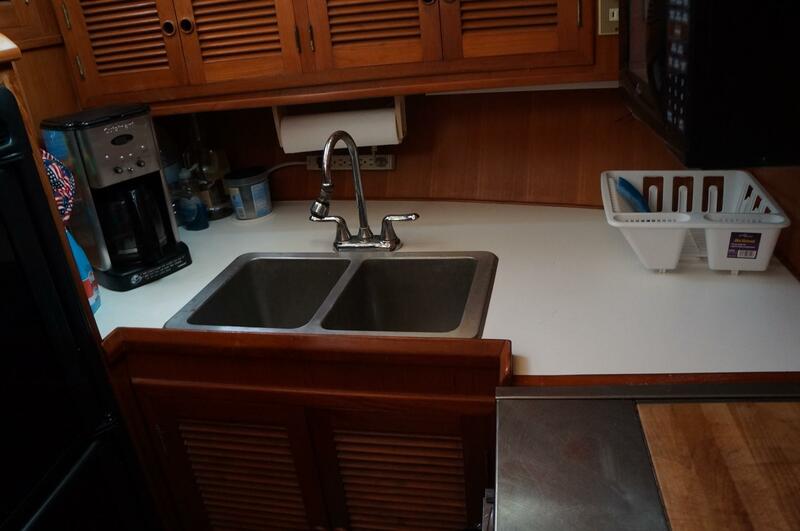 DOWN 2 STEPS IS THE GALLEY WITH HER FULL SIZE NORCOLD REFRIGERATOR, 3 BURNER RANGE & DOUBLE BOWL SINK. 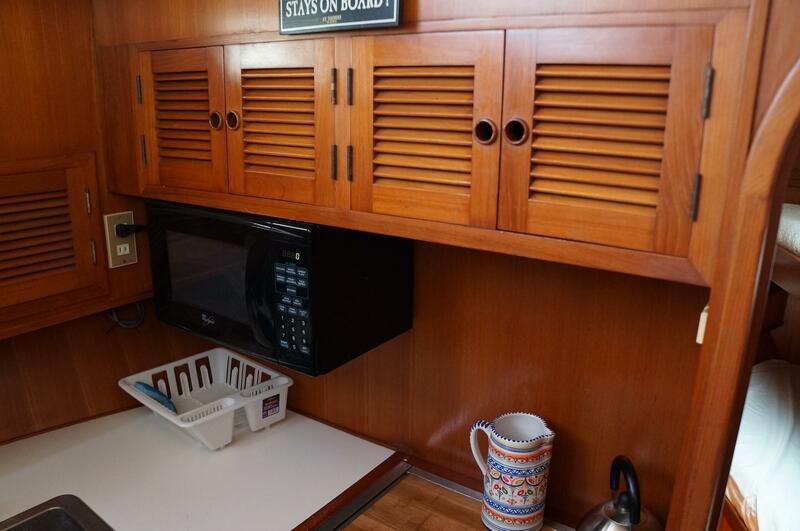 THERE ARE UPPER & LOWER CABINETS & DRAWERS. 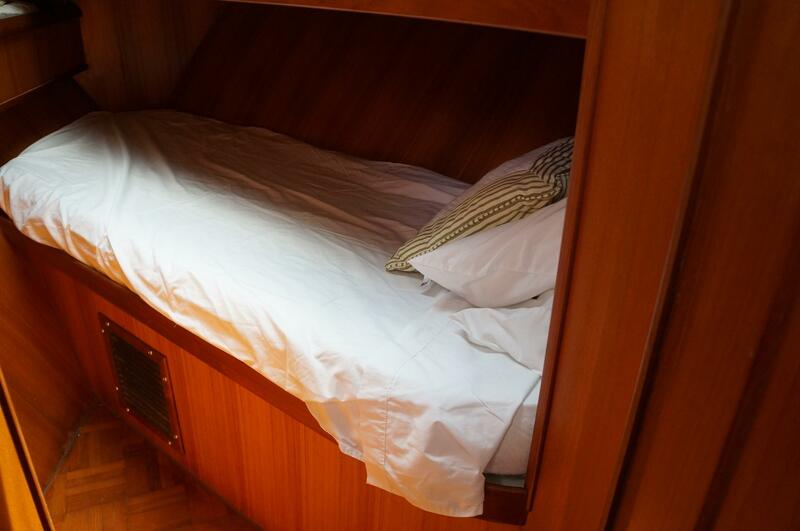 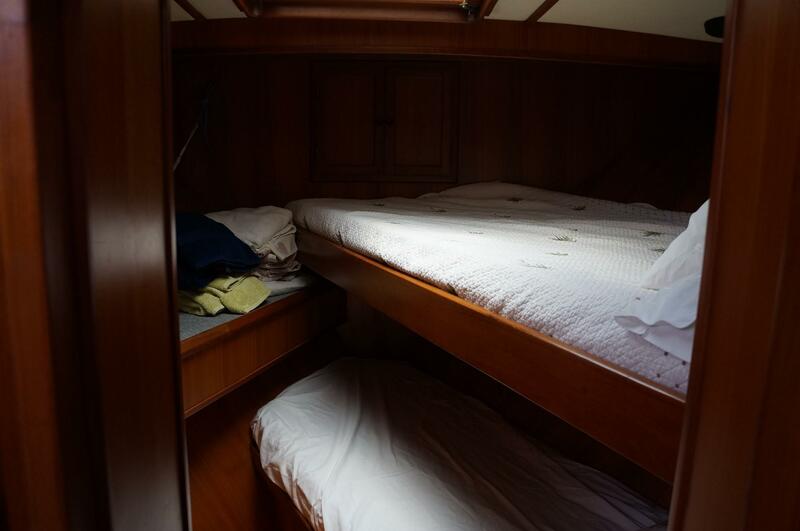 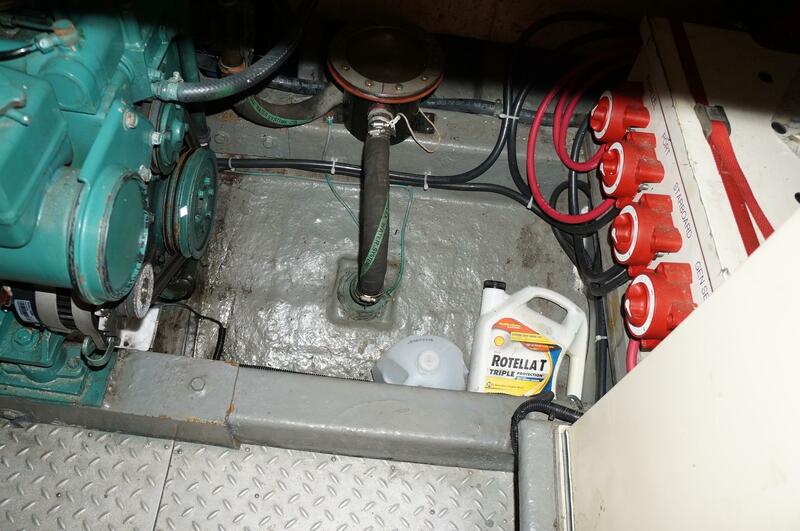 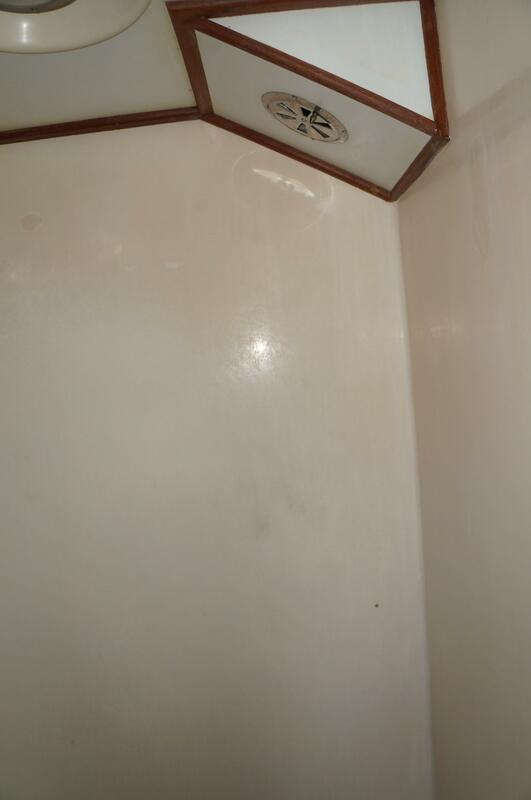 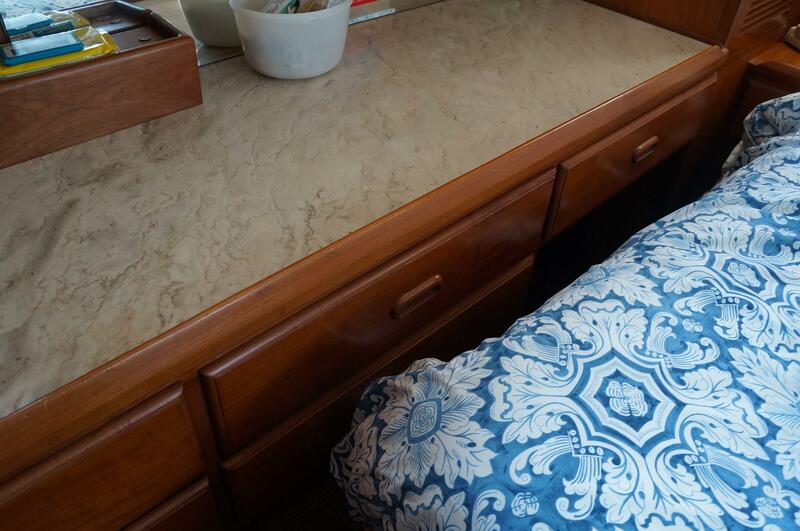 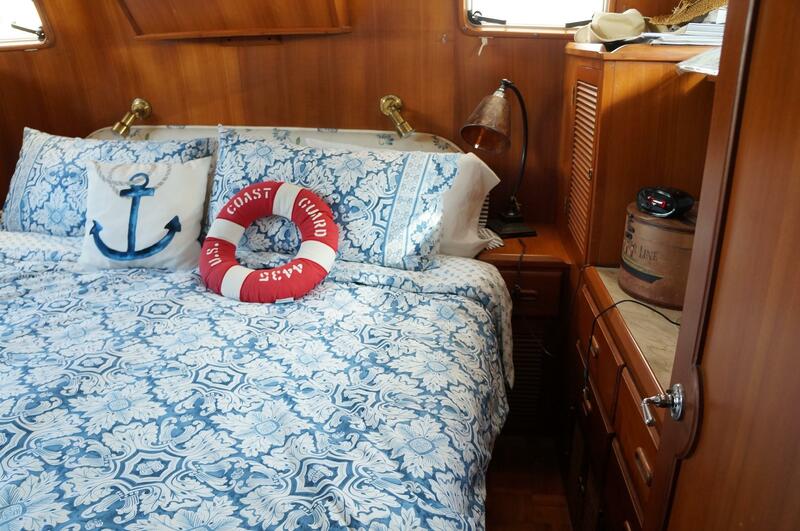 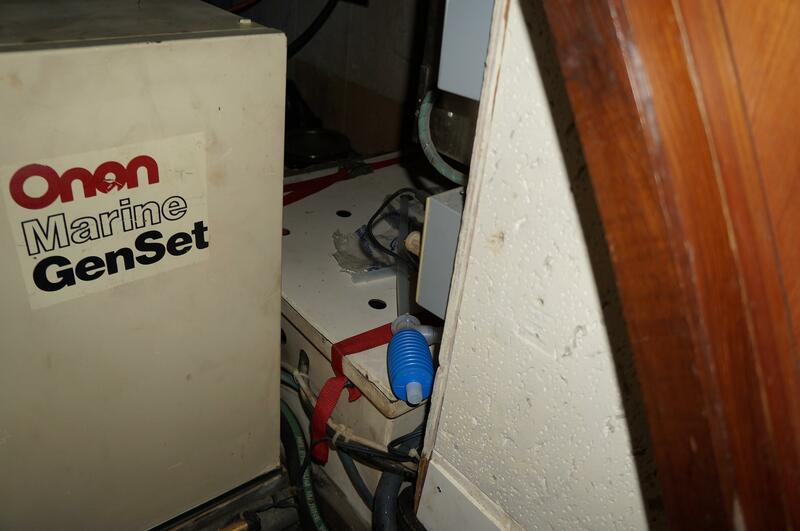 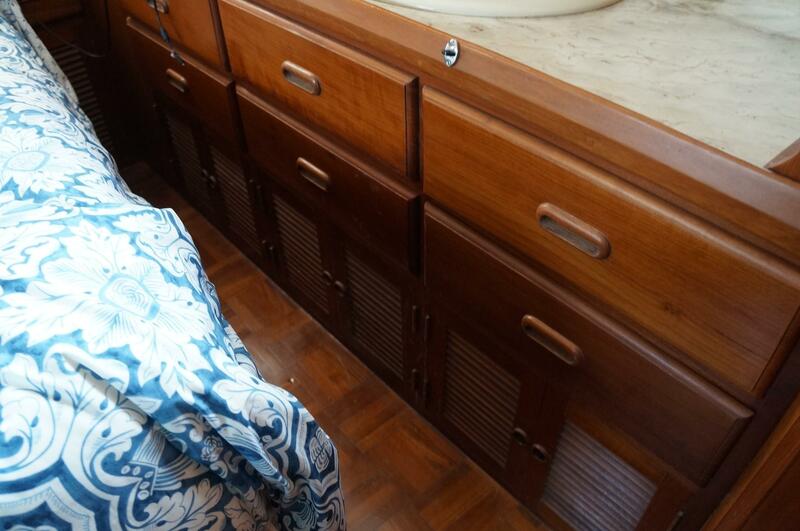 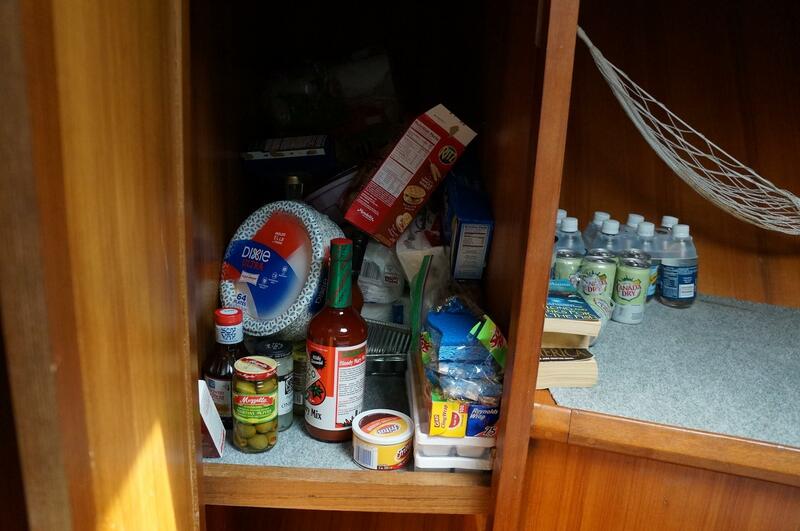 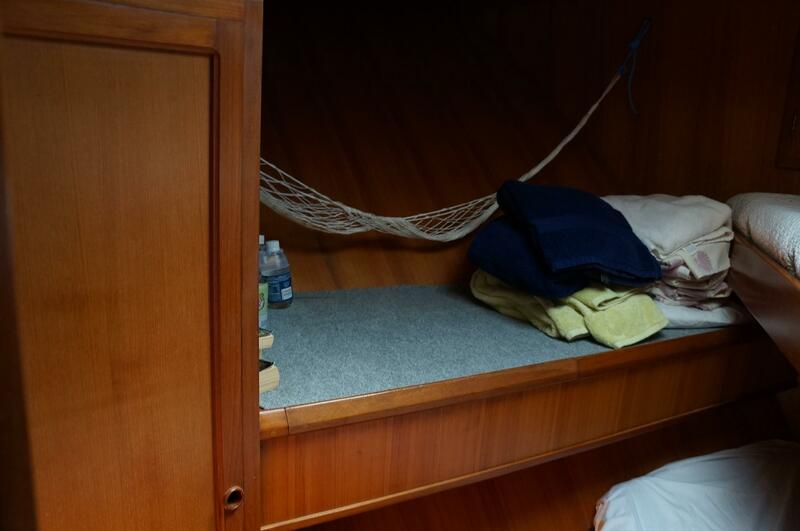 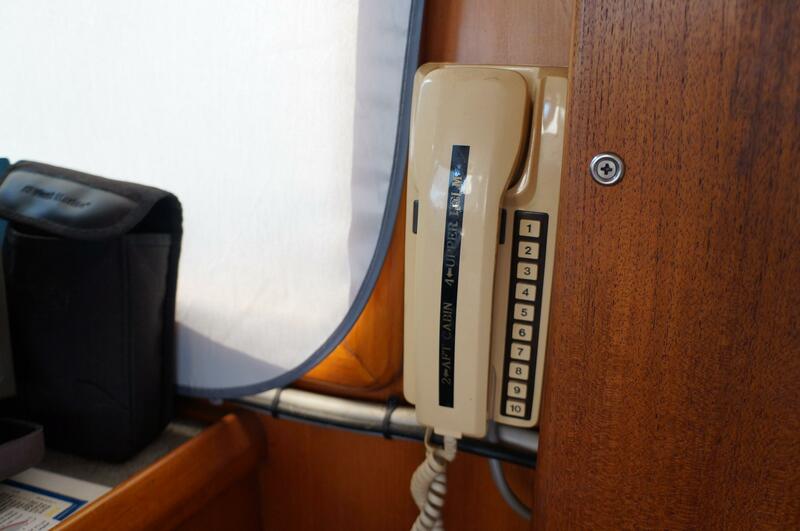 THE FORWARD STATEROOM INCLUDES AN OVER UNDER BERTH WITH DRAWERS & A HANGING LOCKER AS WELL AS COUNTER SPACE. 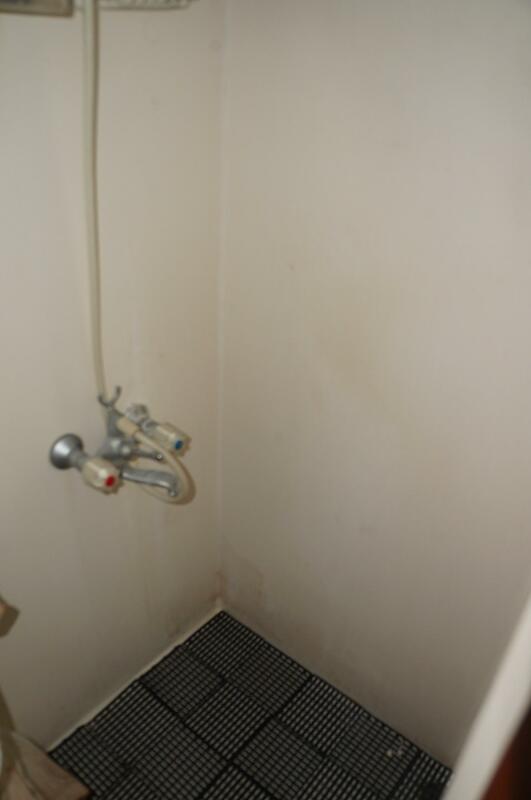 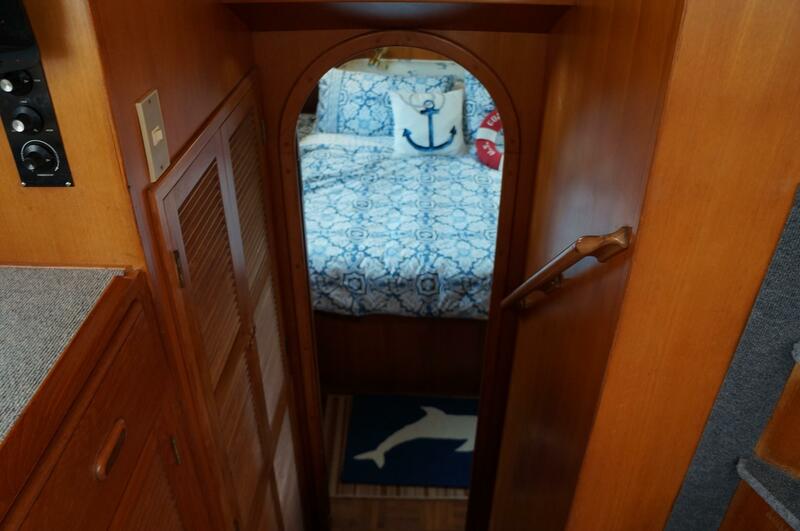 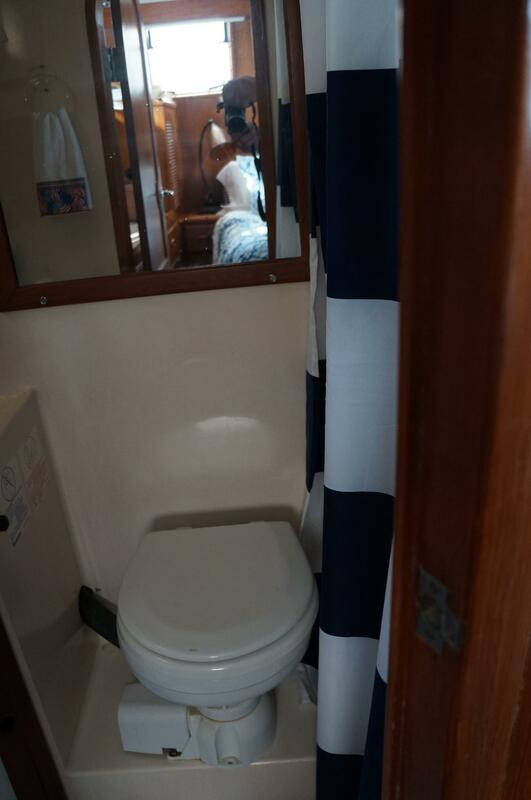 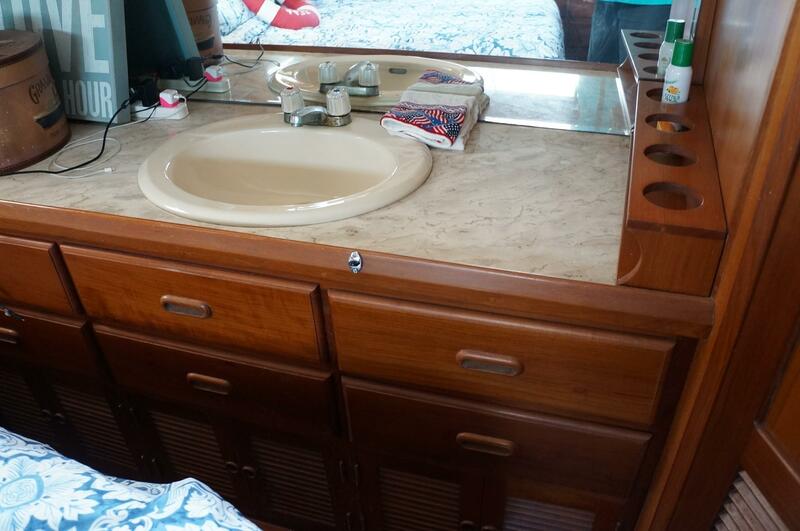 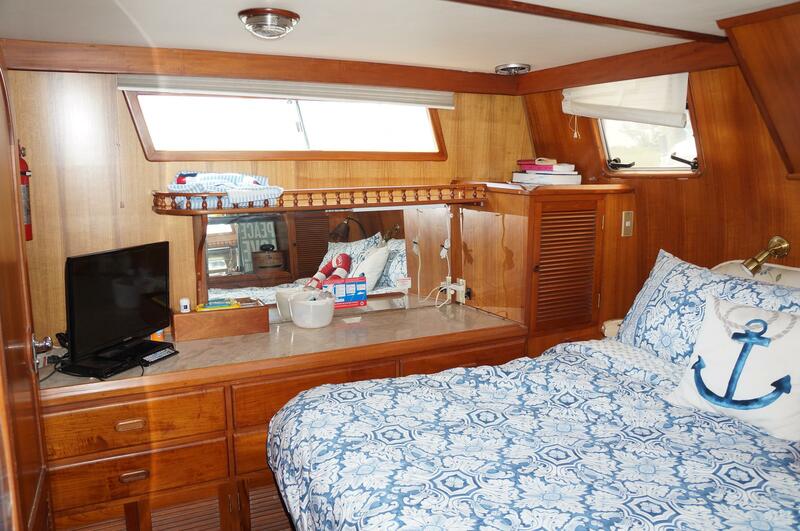 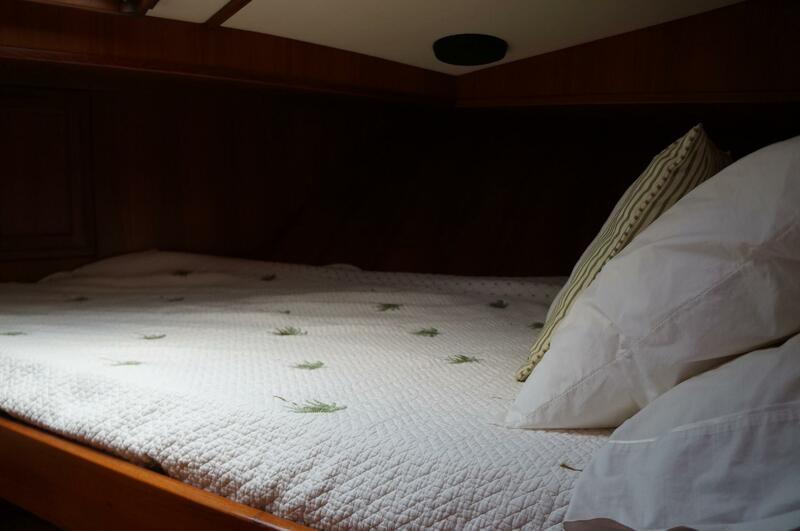 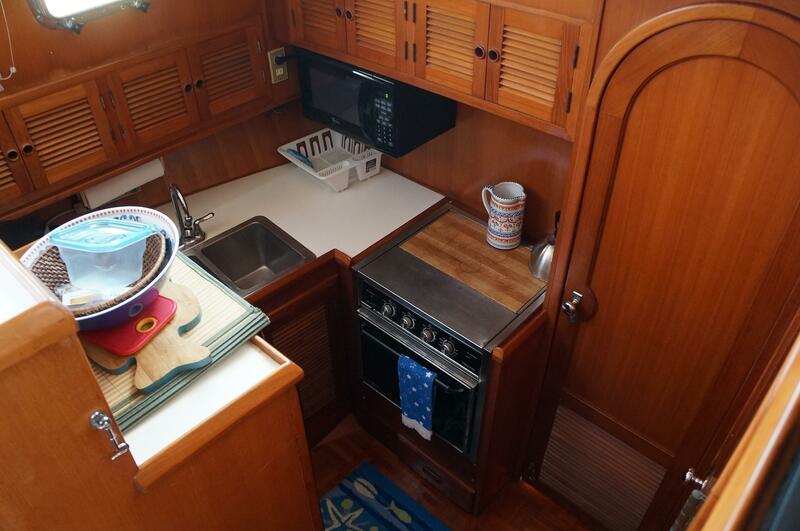 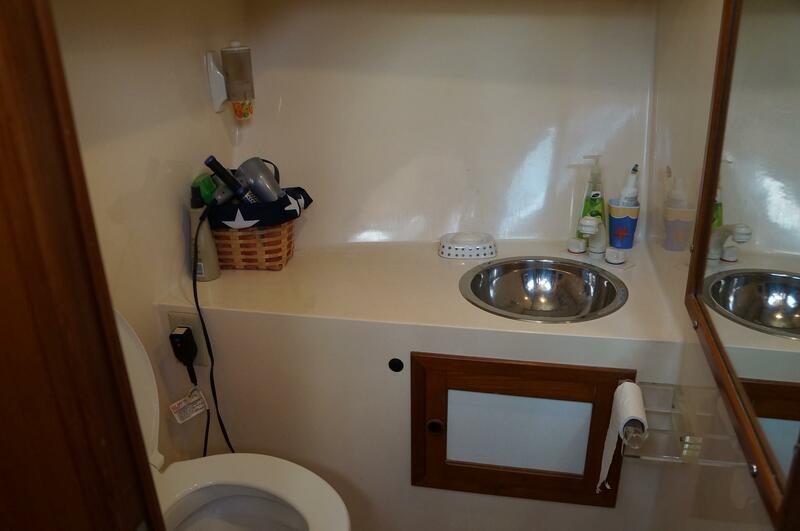 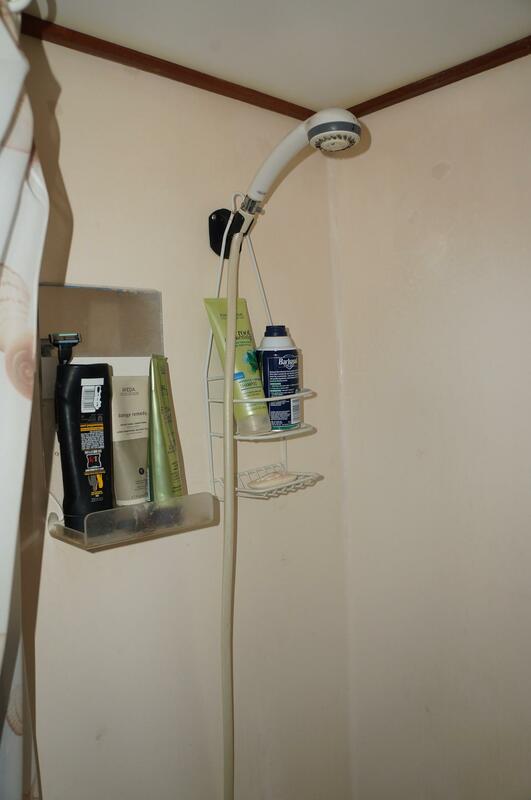 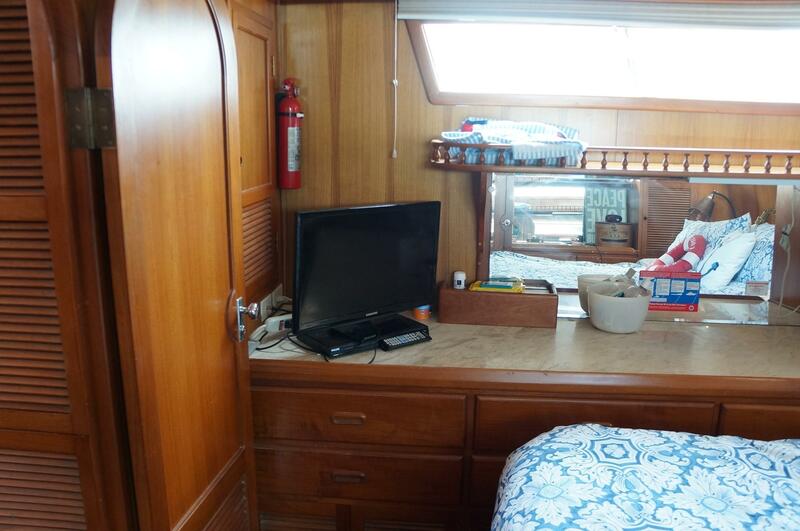 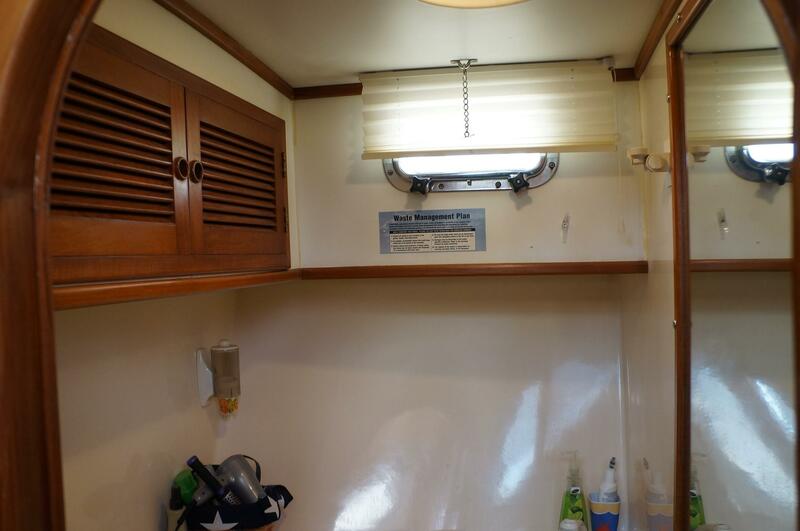 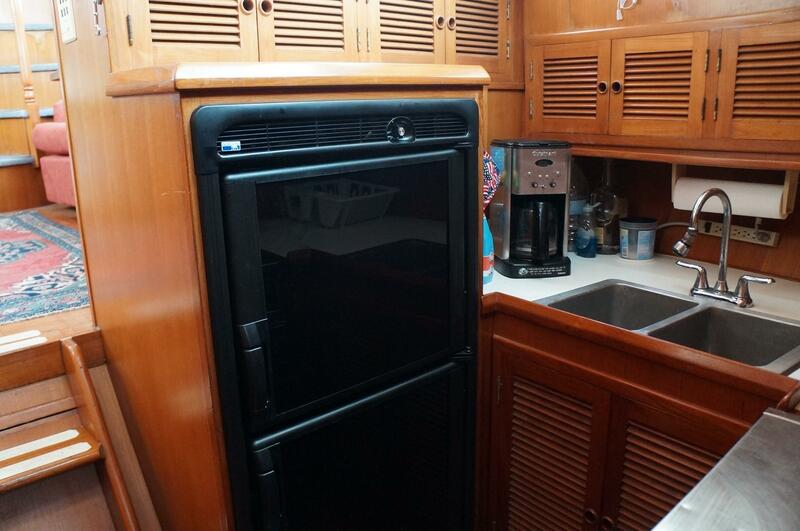 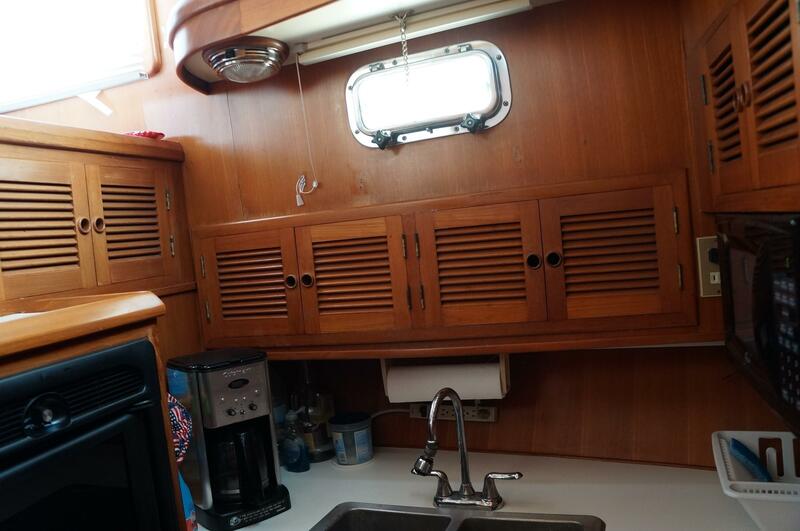 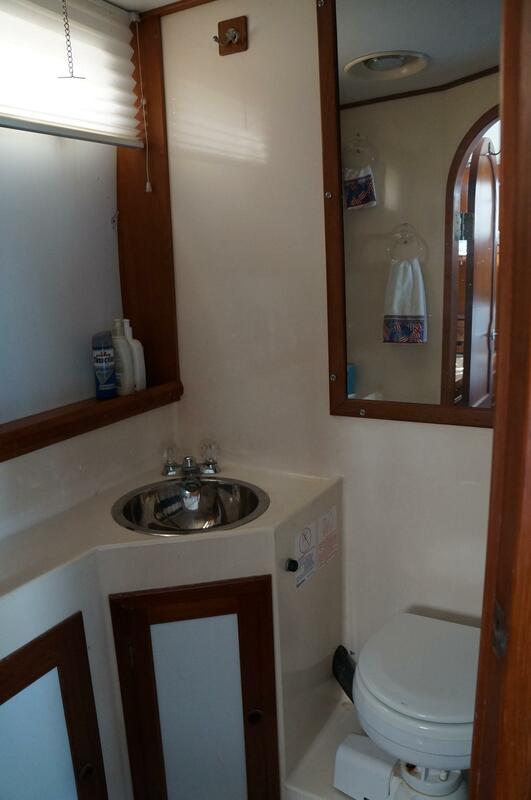 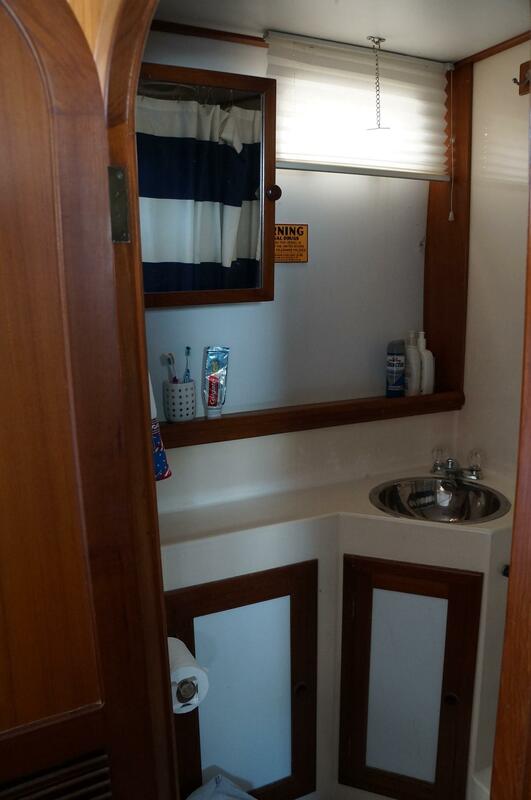 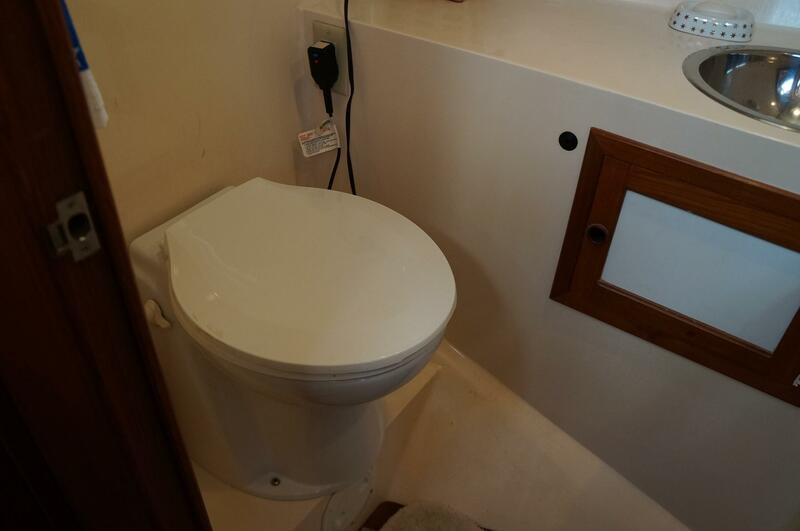 THERE IS A DAY HEAD DIRECTLY ACROSS FROM THE GALLEY W/ AN ELECTRIC HEAD AND VANITY SINK, THE AFT MASTER HAS A KING SIZE BED & A FULL HEAD WITH SEPARATE SHOWER, HANGING LOCKERS AND PLENTY OF DRAWERS AS WELL AS PLENTY OF COUNTER SPACE. 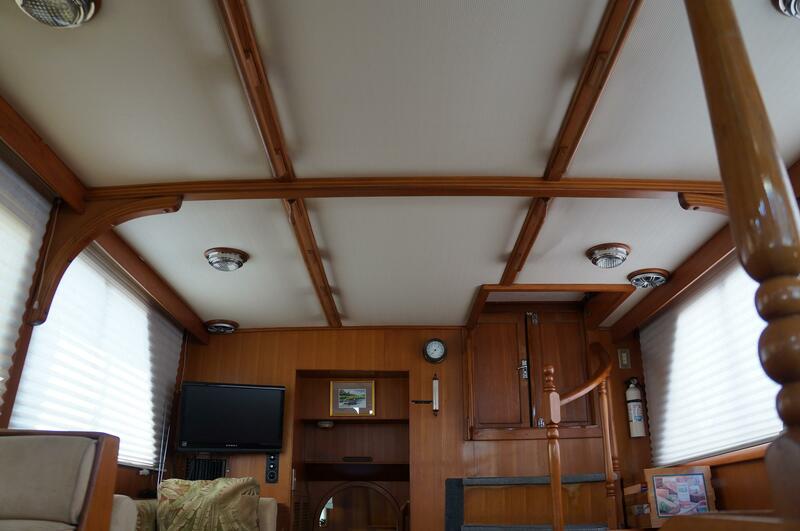 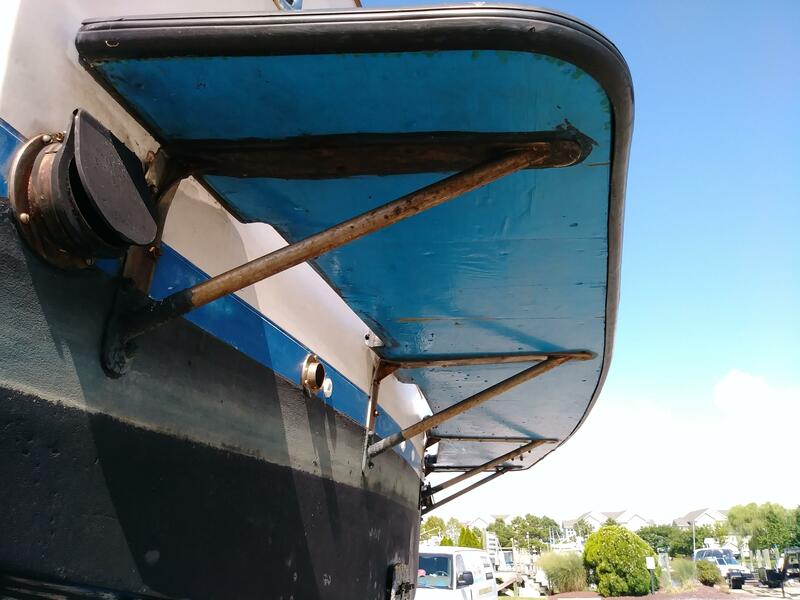 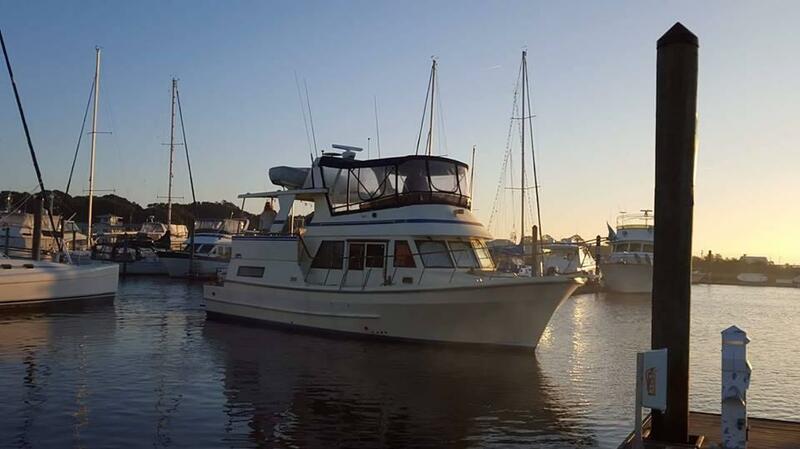 SHE HAS NICE WIDE SIDE DECKS AND A SIDE RAILING ENTRY POINT AS WELL AS A HUGE COCKPIT AREA FOR STORAGE, FISHING, SWIMMING, OR JUST A PLACE TO RELAX AND WATCH THE SUN SET. 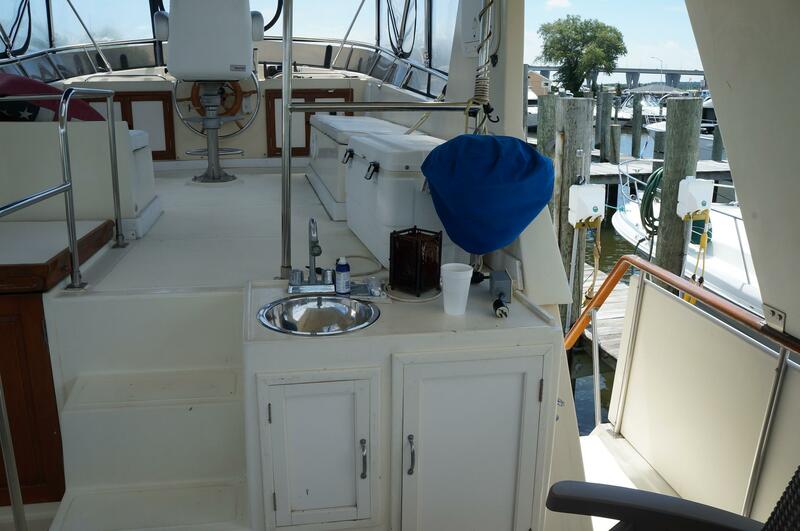 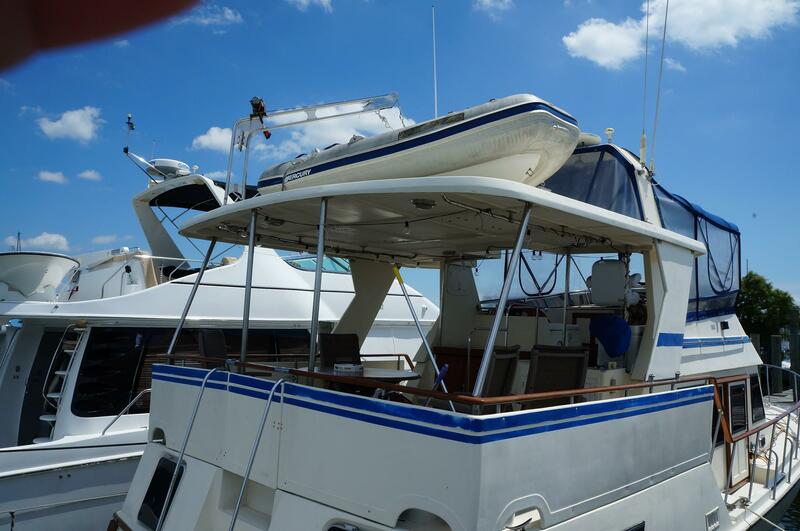 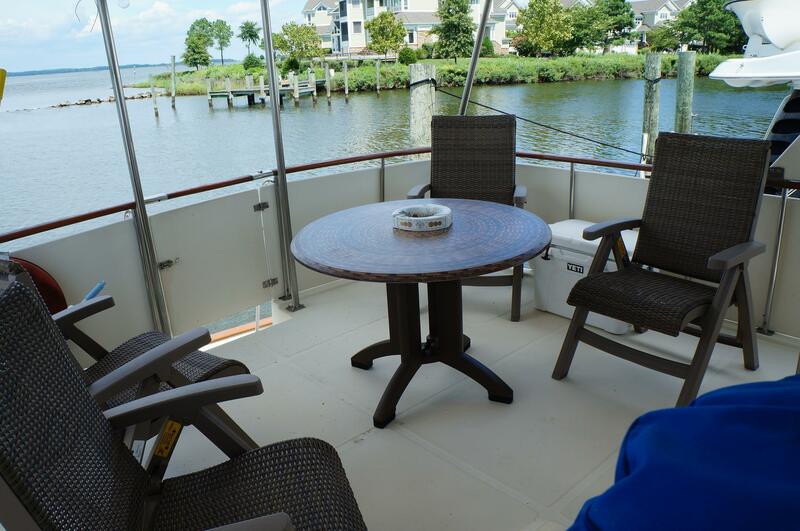 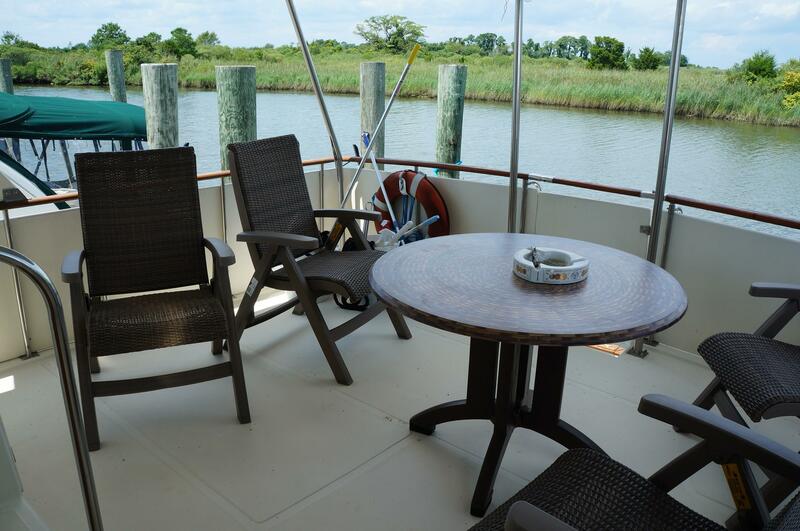 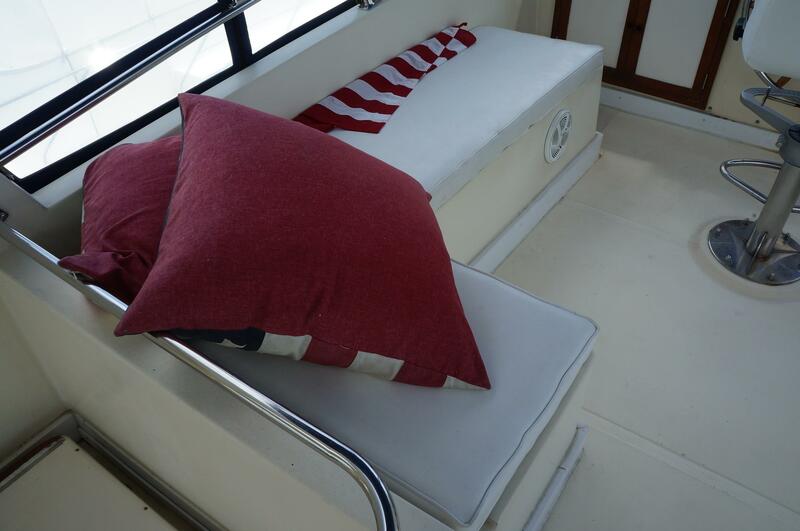 HER AFT DECK HAS ROOM FOR A CROWD UNDER A FULL HARD TOP & INCLUDES A SMALL WET BAR AREA. 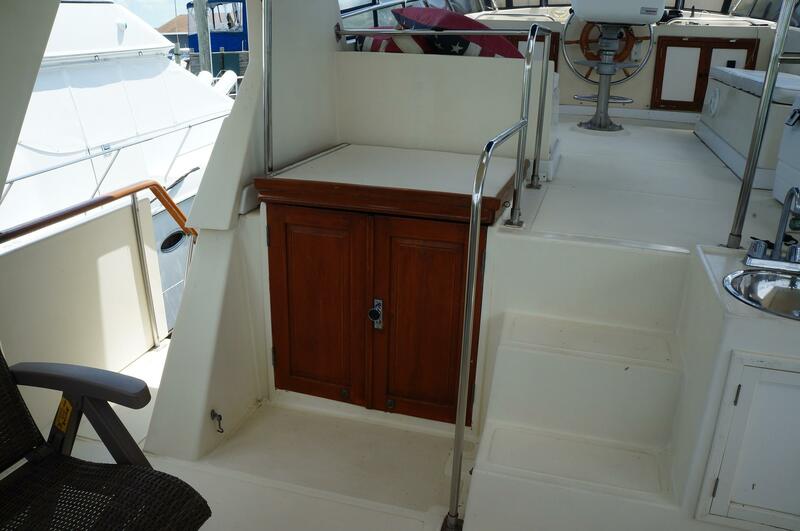 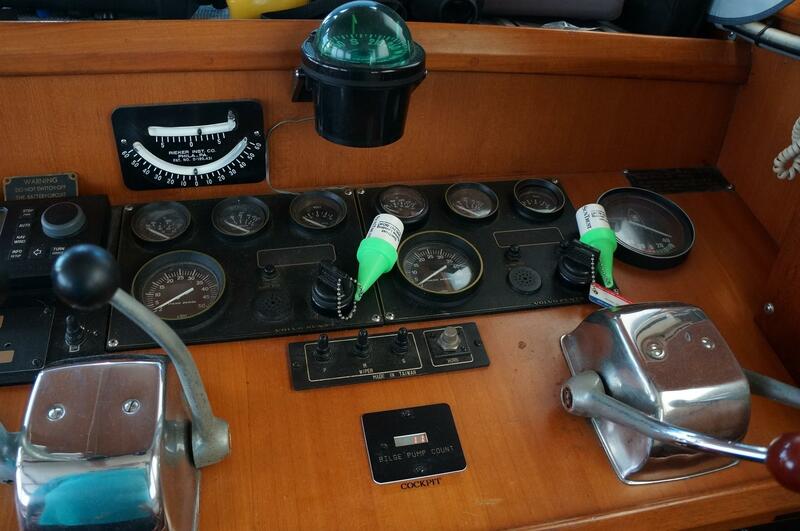 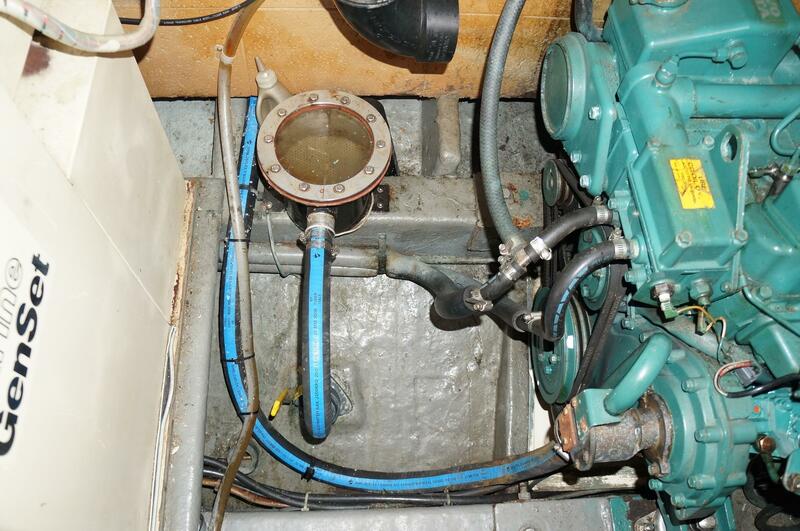 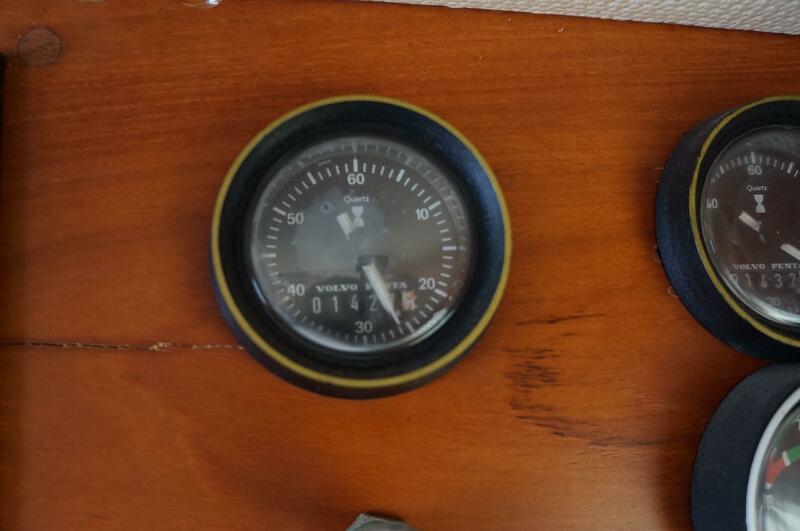 THE BRIDGE ALSO OFFERS A HUGE AREA FOR THE CREW TO SIT & IS A CENTER LINE HELM. 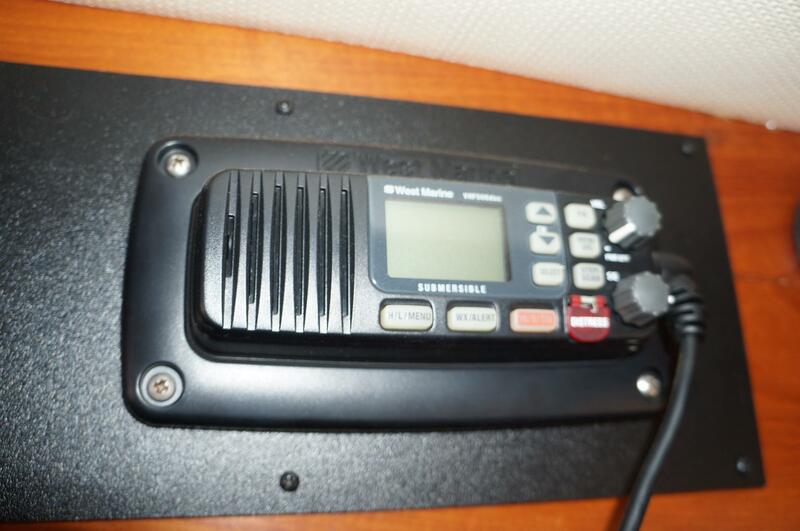 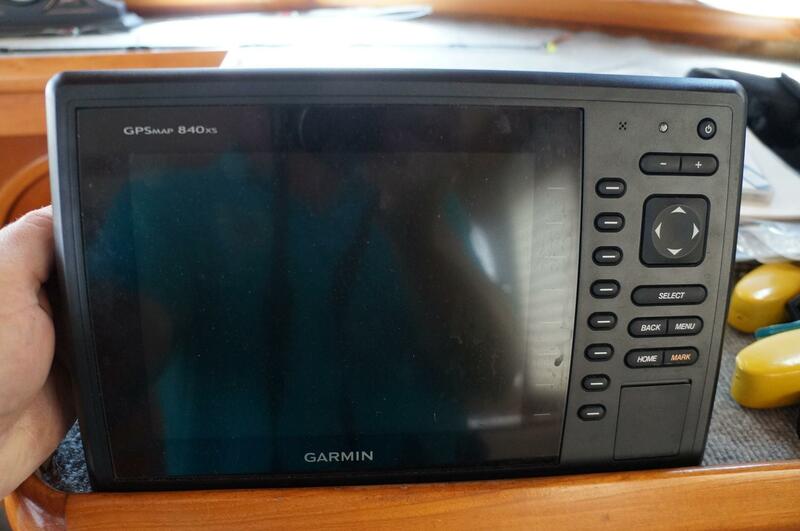 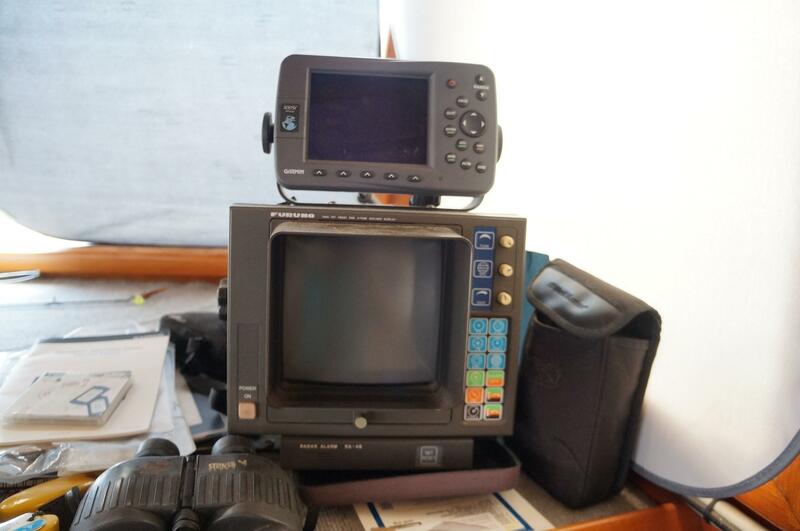 THERE IS A NEW GARMIN 840XS CHART PLOTTER FOR THE BRIDGE STATION. 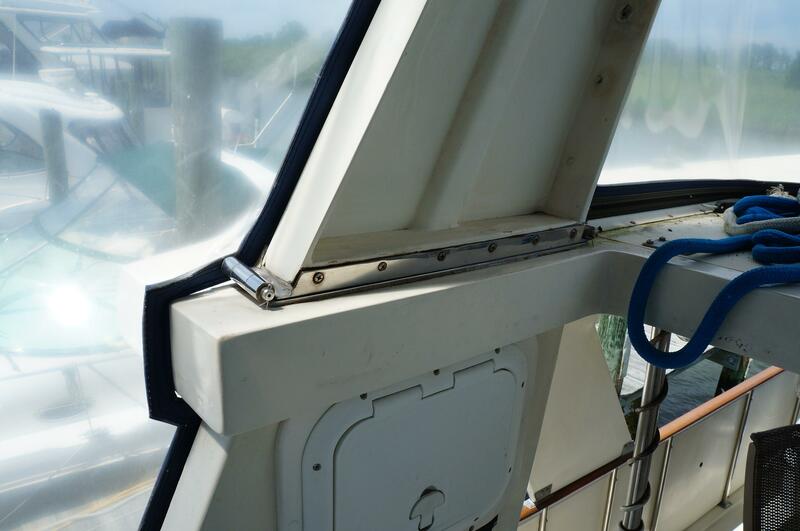 HER BRIDGE ALSO HAS A FULL ENCLOSURE.